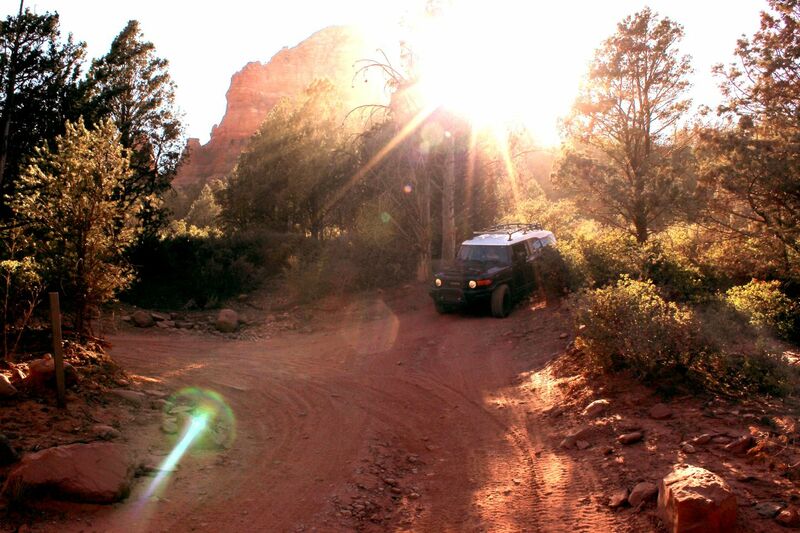 With amazing red rock formations towering into the sky, this off-road trail is full of awe-inspiring beauty. 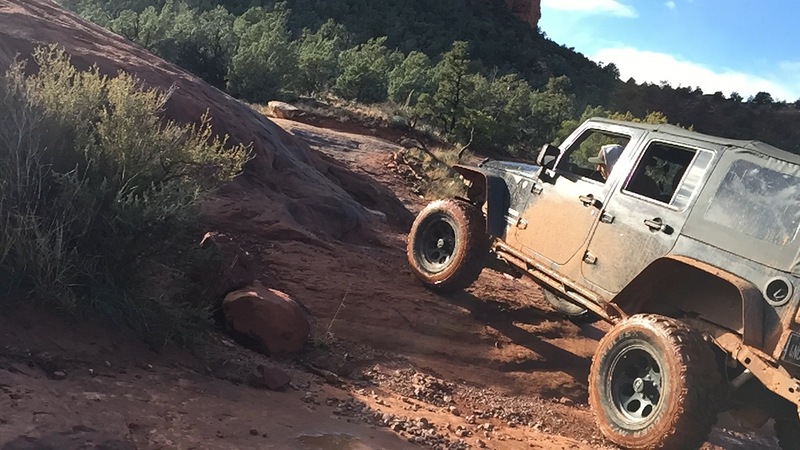 It's no wonder Broken Arrow is one of the most popular off-road trails in all of Arizona. 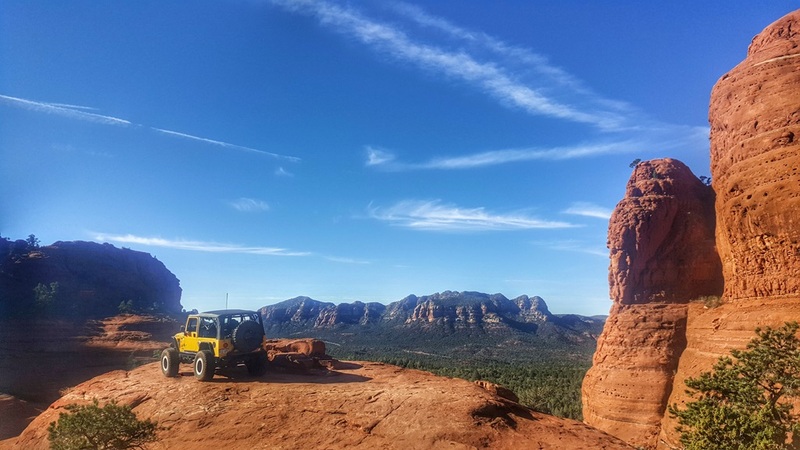 Situated near Sedona, Arizona and within the Coconino National Forest, the trail, and the surrounding area offer the amazing views Sedona is famous for. Nearby you can also find many of the legendary vortex sights. If you arrive early in the morning you can watch the sun's spectacular rise over the high Mogollon Rim cliffs to the north and east. 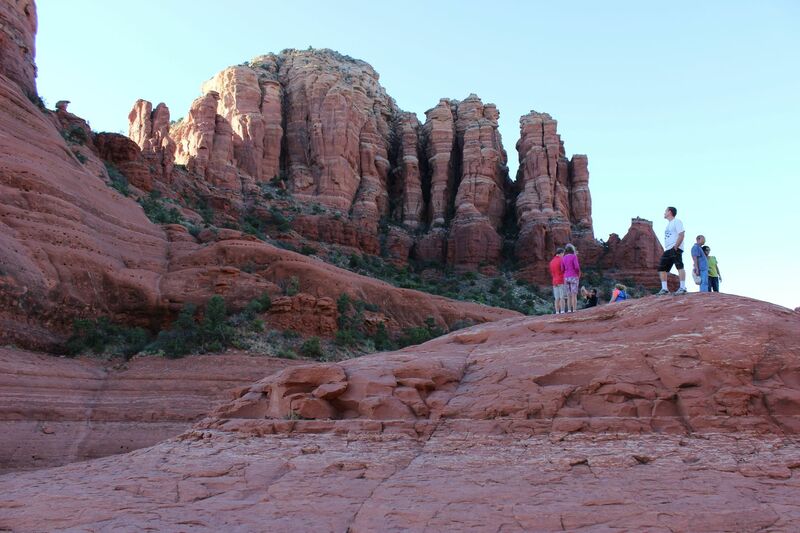 Later in the evening, you can see more dramatic highlights of the natural features as shadows become more pronounced, and in some spots, amazing silhouettes as the sun is eclipsed by the towering rock formations to the west. 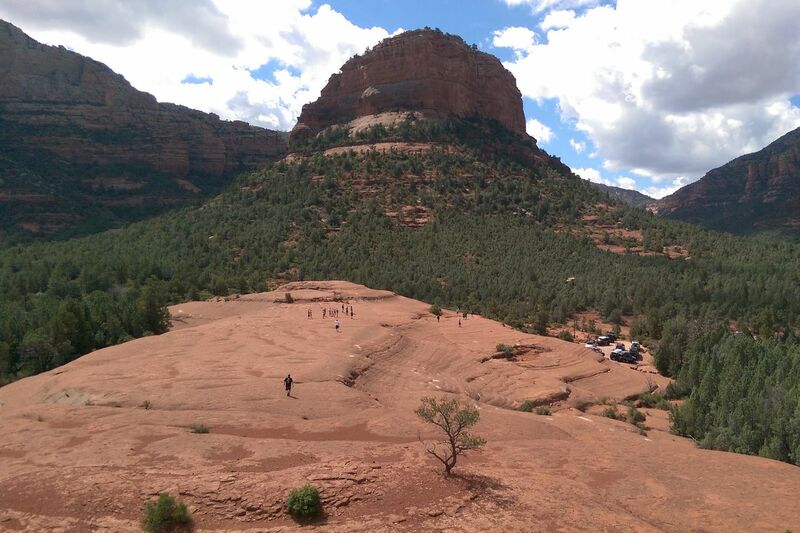 Either event is likely best viewed from Submarine Rock - a large rock formation you can climb on - or one of the higher elevated spots along the trail. 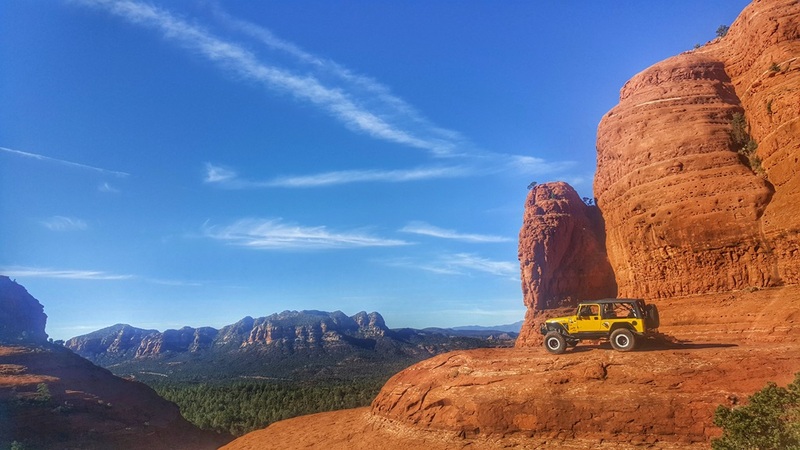 This is a must see off-road trail everyone needs to put on their bucket list, but it will require a capable four-wheel drive off-road vehicle to traverse. Typically, more rock or undulated road surface. Potential rocks and/or tree stumps less than 18" tall and/or vertical ledges less than 18" tall and/or near vertical ledges or waterfalls less than 36" inches. Tire placement becomes more difficult. Can be steep and off-camber. 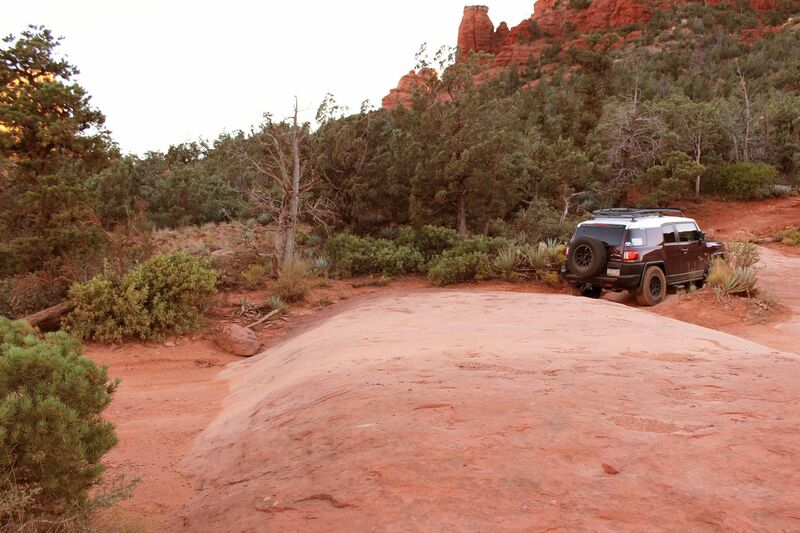 After a short drive down a relatively easy red sand and dirt off-road trail, the fun really starts with a sizable but rounded off ledge preventing less capable vehicles from accessing the majority of the trail. 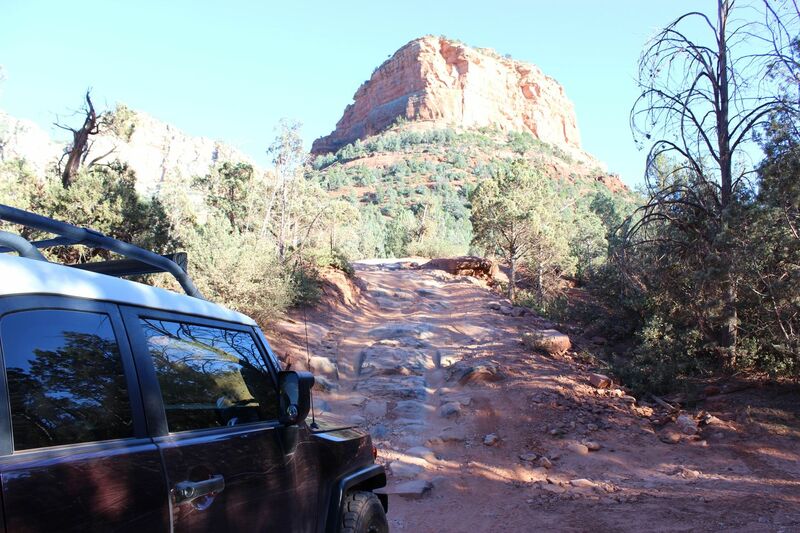 You'll continue onto the first patch of red slick rock that you'll find throughout this 4wd trail; however, the most challenging parts of the trail are still to come. 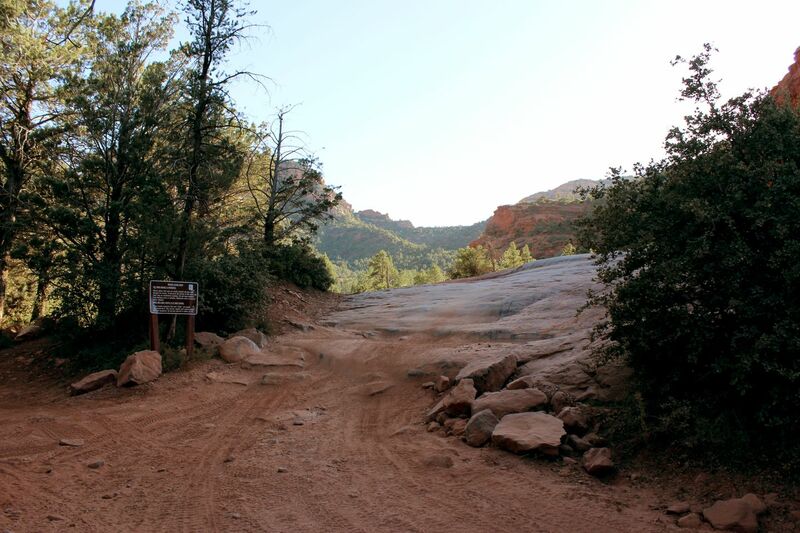 The trail is well maintained so it's not too bumpy, but it's also designed to be challenging with steep hills and slick rock areas. There are plenty of places to stop and do some sight seeing, which you'll definitely want to do thanks to the amazing scenery. 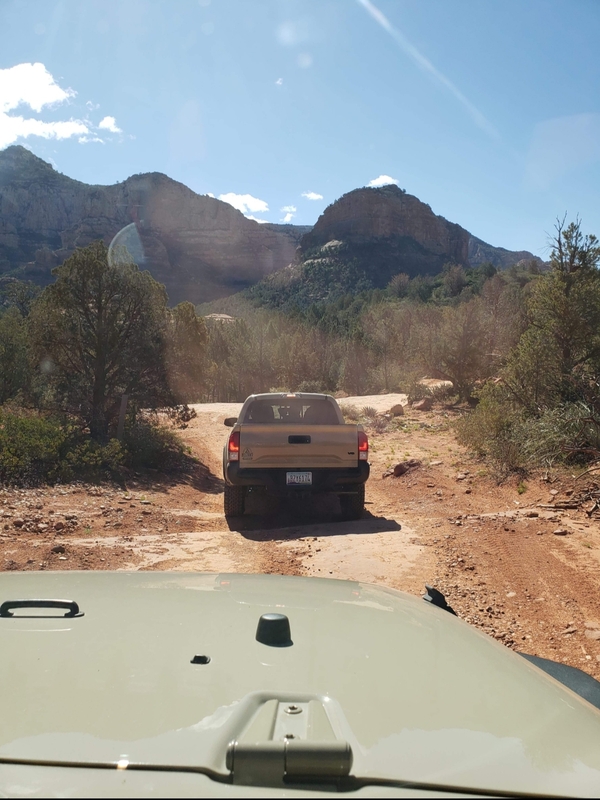 The off-road trail can also get crowded, especially on the weekends, making some spots difficult to pass through even if your following the discreet directional arrows found at most intersections. Fortunately there are plenty of pull off areas near the narrower parts of the trail. 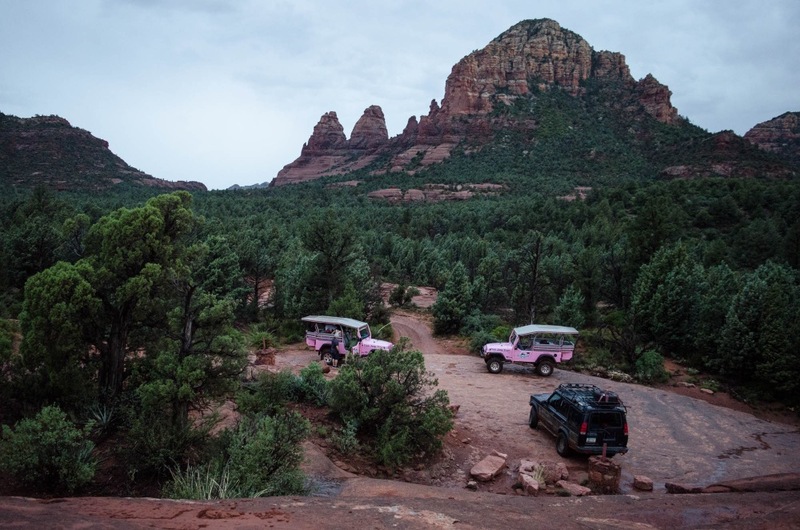 Also, be sure to watch out for the Pink Jeeps and other 4wd vehicles chauffeuring tourists around the trail; they tend to travel in packs. 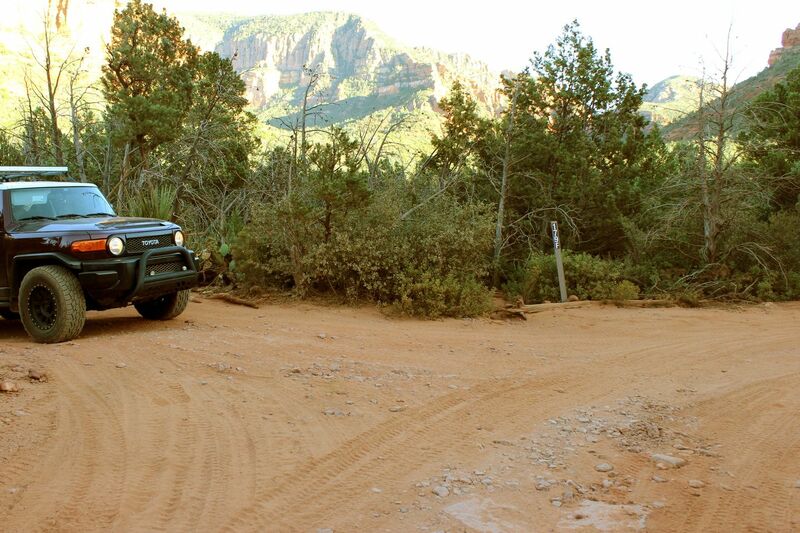 You'll also need to be aware of people on foot who are occasionally on the four-wheel drive trail. 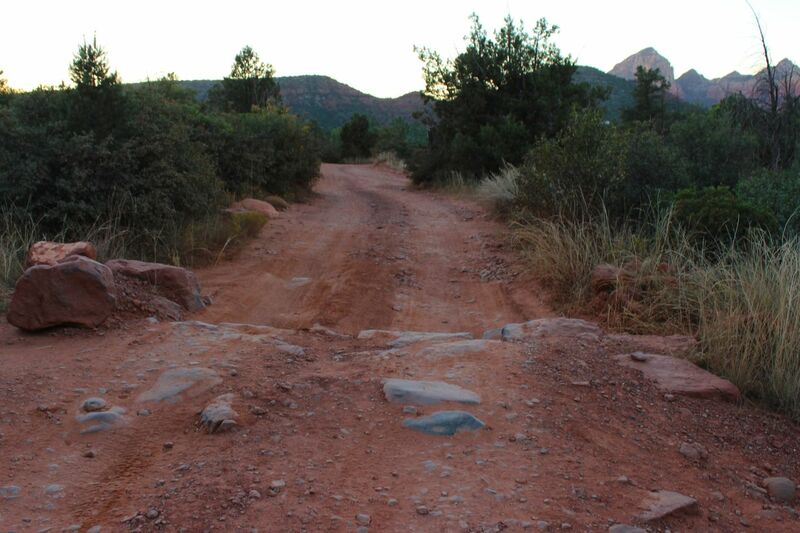 For the majority of Coconino National Forest no permit or pass is required; however, if you plan to stop in any of the "improved" areas you will need to pick up a pass, and there is a high concentration of "improved" areas around Sedona. 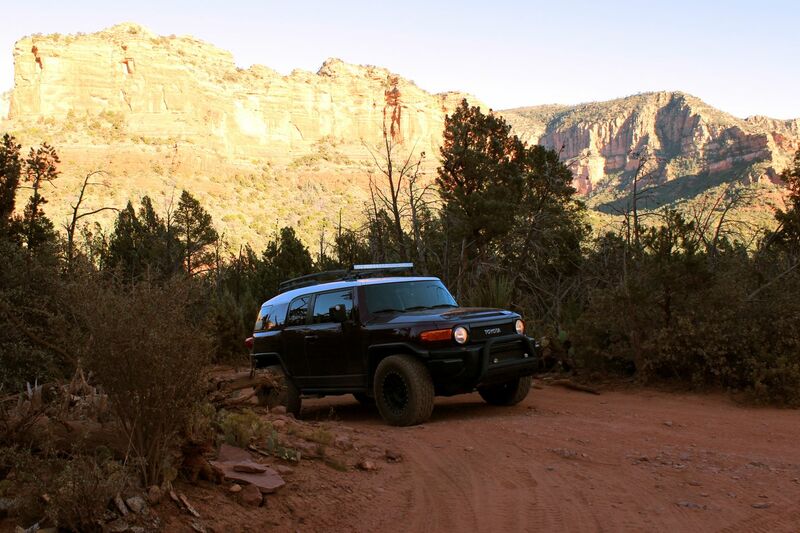 Also, be sure to stay on the designated roads and trails as much of the vegetation and rock formations are fragile. The trail is straight ahead from here. 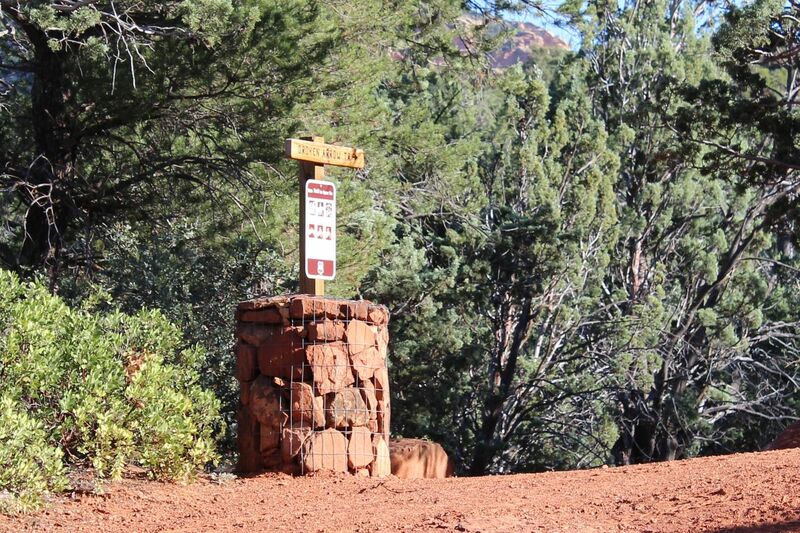 The trailhead is at the end of Morgan Road near the southern end of Sedona. 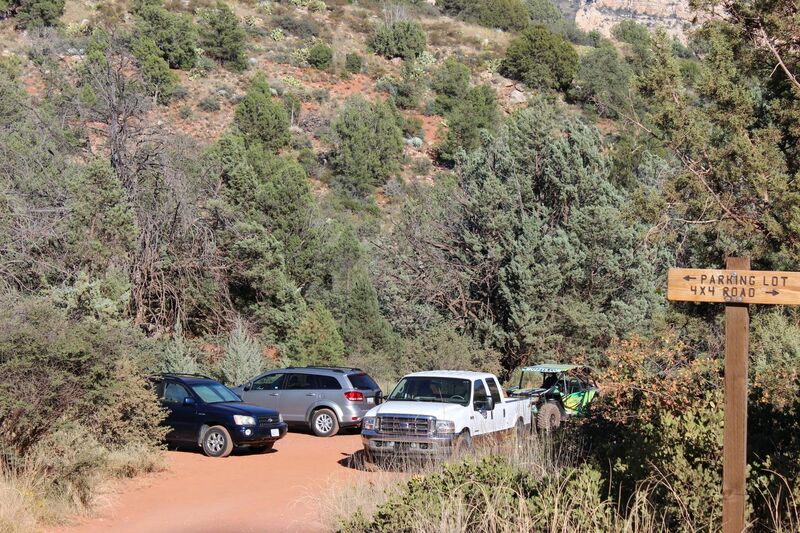 Many people coming here are hikers, so it is common to see regular vehicles near the trailhead and in the parking lot. This is a great place to air-down before heading in, and air-up on the way out. There's also a trash can and informational posters in the parking area. This is also where the Broken Arrow hiking trail beings. This speed bump is actually a decent step up at the beginning part of the Broken Arrow Off-road Trail, and will prevent low clearance vehicles from continuing down it. It's also where hikers cross the road and is intended to make you slow down and stop for the pedestrians. 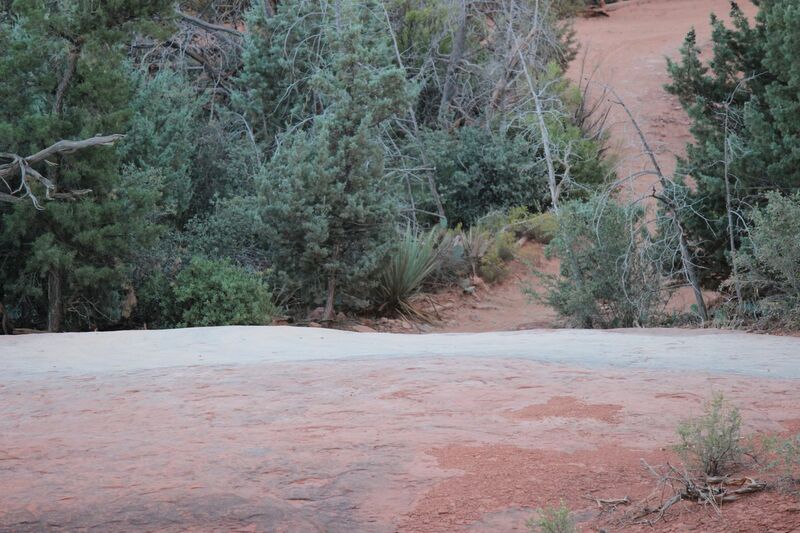 The ledge is to the right and is the first big obstacle on the trail. If you can't get up it, or are too timid to even try, there's a tight turnaround straight ahead. 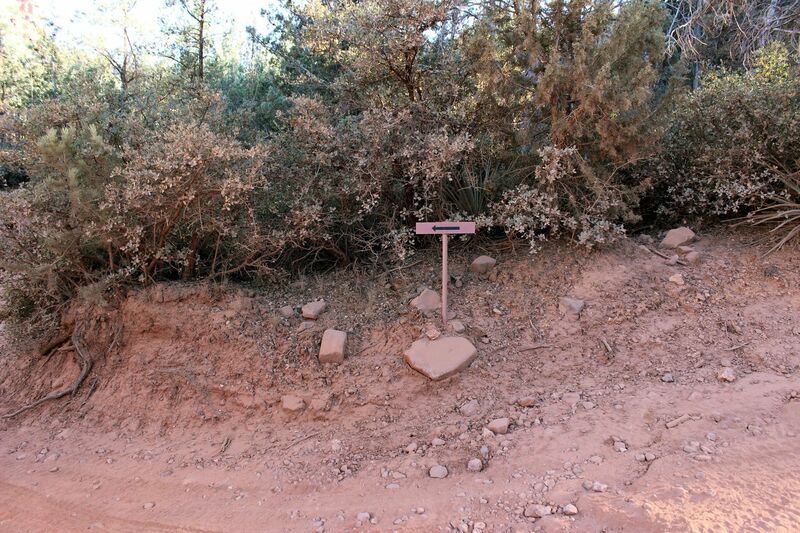 This ledge keeps less capable vehicles out of the majority of the trail, and for good reason as the adjacent sign spells out. 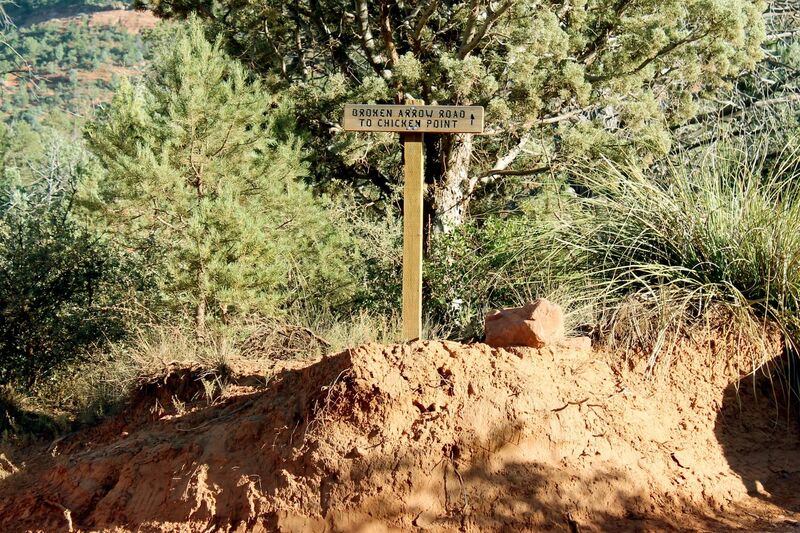 The sign has information about the 4x4 trail and warnings of its potential danger. This ledge is the edge of a red slick rock area that you can play around on with the rest of the trail to the southeast corner. This is another parking area for those who don't want to park at the trailhead parking and have a vehicle capable of reaching this point. 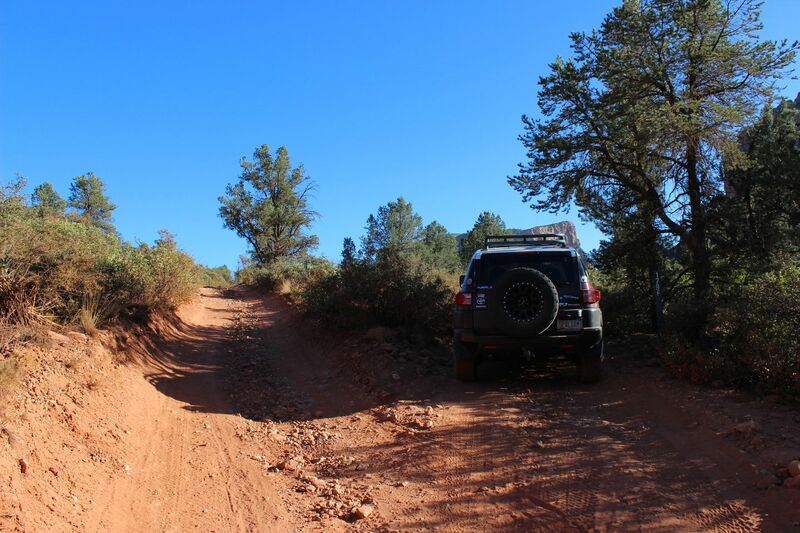 You can hike to this point from the first parking spot, and considering you need a decent 4x4 vehicle to get to this point anyway, the only reason I can think of to stop here is if you get overwhelmed by the off-road trail and decide to hike instead. 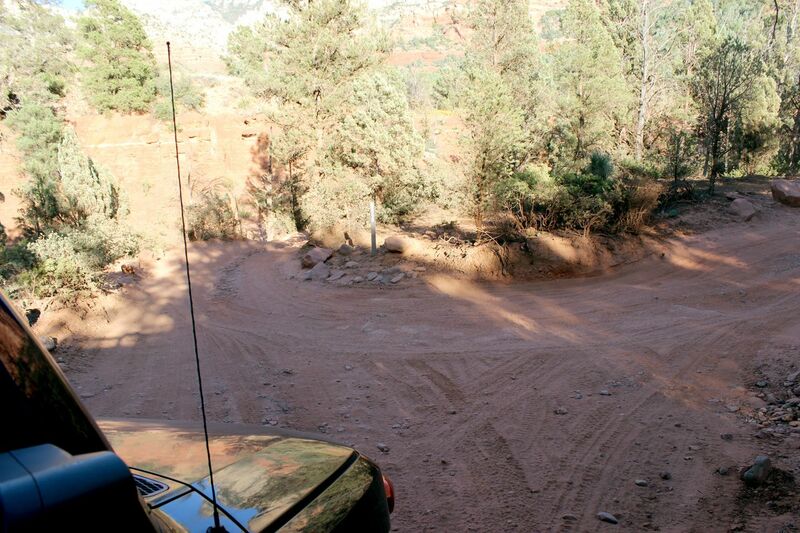 Go straight at this intersection to continue on the Broken Arrow 4x4 Off-road Trail, or you can turn right to head to the hiking trail parking area. Stay right at as the trail splits at this point, even though both sides will get you to the same spot. 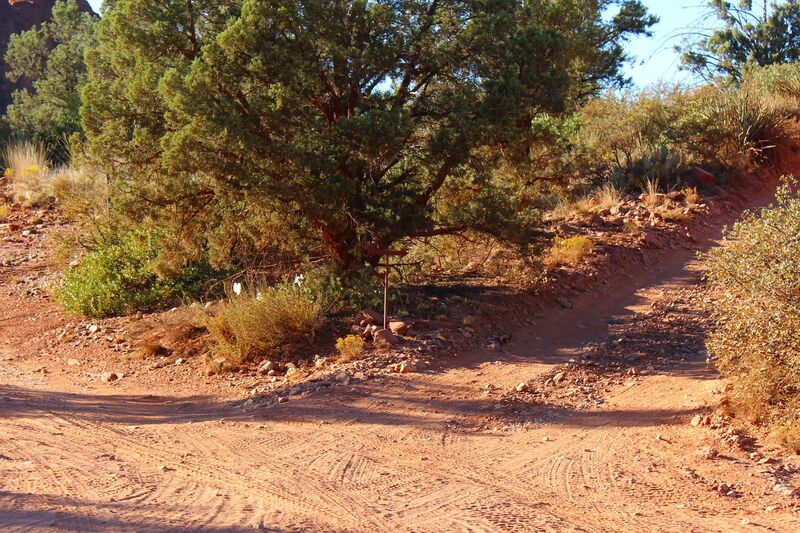 There even an arrow directing you to stay to the right as a way to help prevent traffic jams on this narrow 4x4 trail. This is a hiking trail intersection. 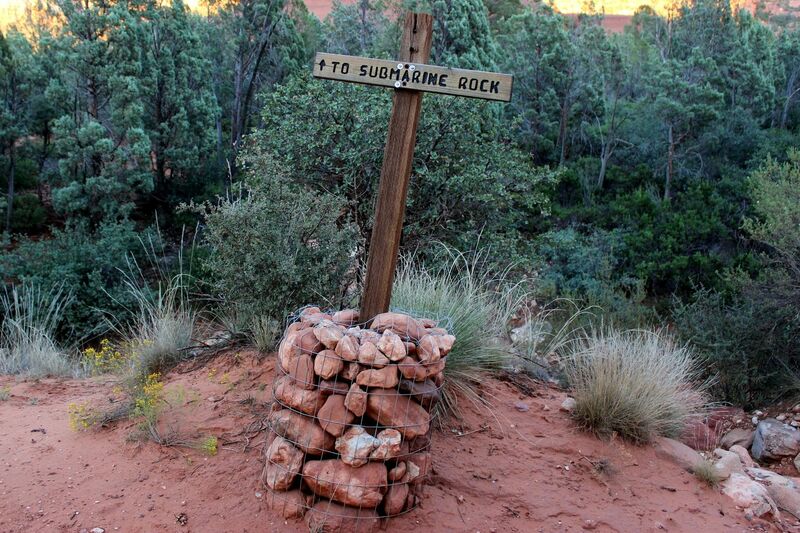 Watch out for hikers heading to and from Submarine Rock. Stay left at this intersection, as you are directed by the directional arrow. This is because to the right is a narrow and very steep set of stairs that are part of the return path from Chicken Point. 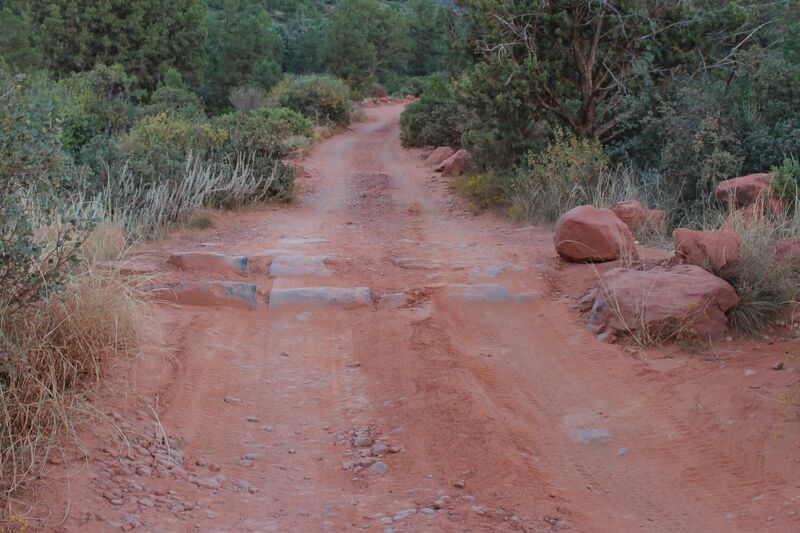 As with the Split, it's meant to prevent traffic jams on the most difficult part of the trail. Turn left (east) to get up close - or on top of - Submarine Rock, but if not interested in this amazing rock you can stay right (south) to continue on down the trail. I'd recommend going left, but if you're unsure of your ability to climb the next obsticle, you'll want to turn around and head back at this point. To get to Submarine Rock, you must climb a hill that is basically a rutted and stepped boulder at the far side of a dry river wash. If there's a heavy rain you'll want to avoid this area, as flash flooding could catch you off guard. Also keep in mind, this is the only way to drive back out from Submarine Rock. 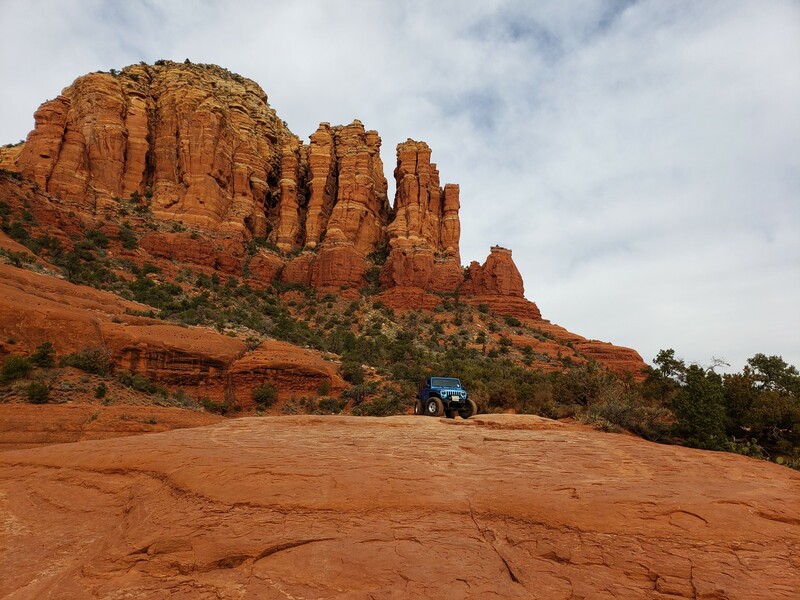 There's limited parking right up next to Submarine Rock, but there is additional parking off to the side of the 4x4 Off-road trail as you approach this massive rock formation. 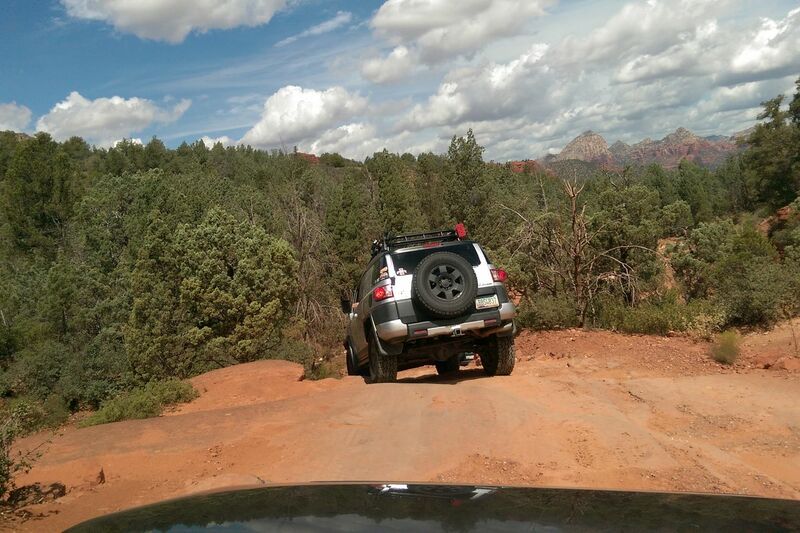 If it looks full, your best bet is to stop, back into a spot off the main road, and hike in a short way. 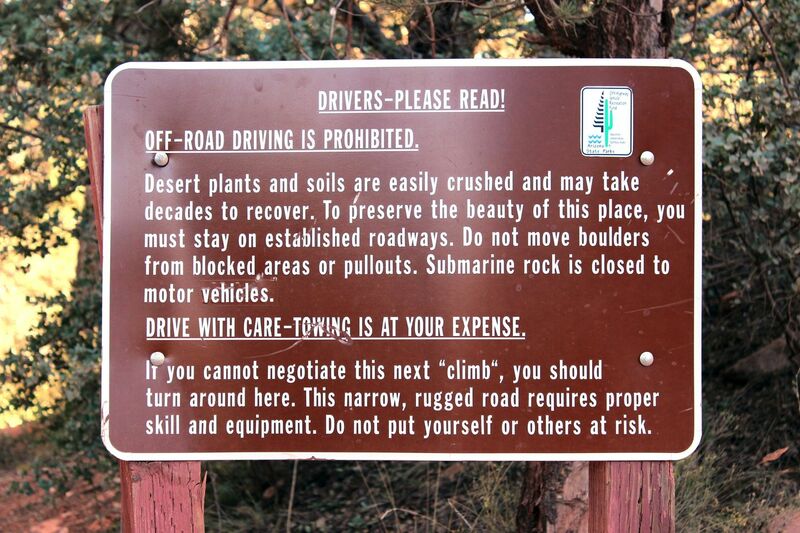 You cannot drive on Submarine Rock, so if you want to explore it, plan on climbing up on foot. 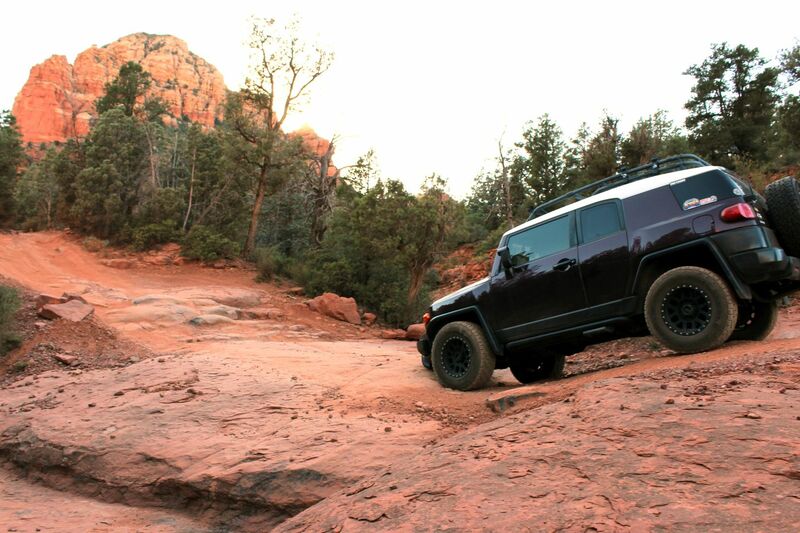 If you're not good at climbing, you may just have to enjoy it from the parking area. 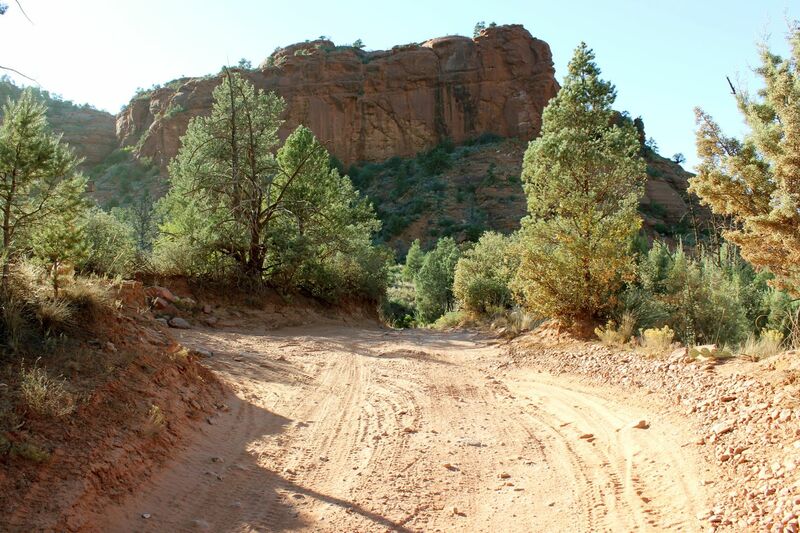 If you skipped Submarine Rock, you still have an opportunity to drive through the dry river wash that divides it from the main off-road trail. 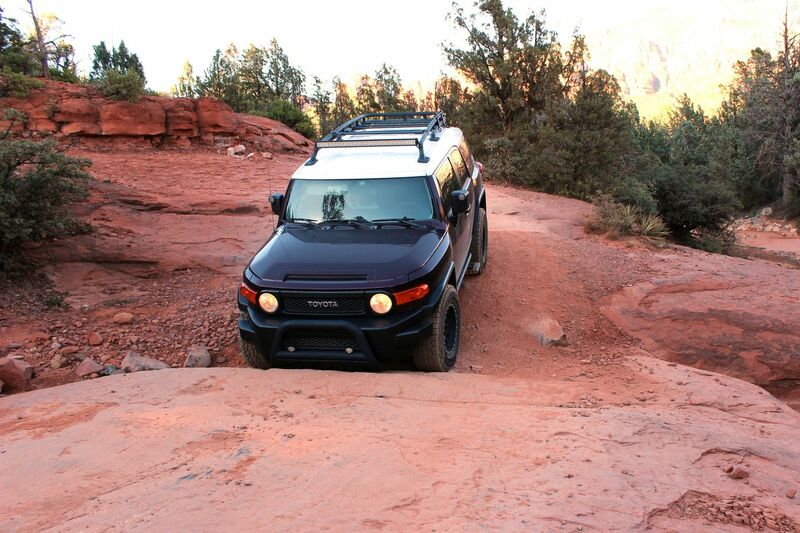 Without good clearance, you may find your bumpers getting scraped as you navigate your way through this crevice. Another dry wash, not as pronounced as the previous one, but still worthy of noting. 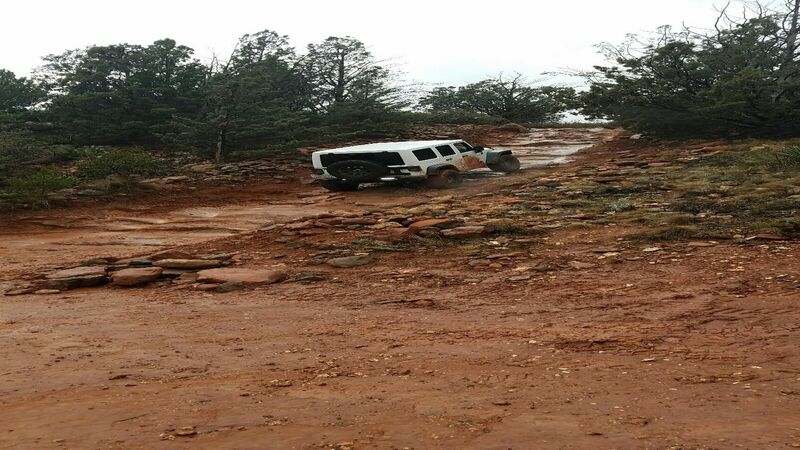 This is one of the easier obstacles throughout the Broken Arrow Off-Road 4x4 Driving Trail. The trail starts to get extra curvy as this point, so it's wise to mind Broken Arrow Trail's 5 mile-per-hour speed limit and take it slow. Otherwise, you could easily and suddenly come upon someone or something unexpectedly; like someone who's decided to "chicken" out on the most challenging part of the trail. Turn left (south) at this intersection to head to the most scenic part of the trail. To the right (northwest) is the most challenging part of the trail, but since going left has no outlet you'll be coming back this way anyway. If you're feeling uncomfortable at this point and decide to "chicken" out, you can turn around and head back (northeast), but you'll be going against traffic that won't be expecting you. 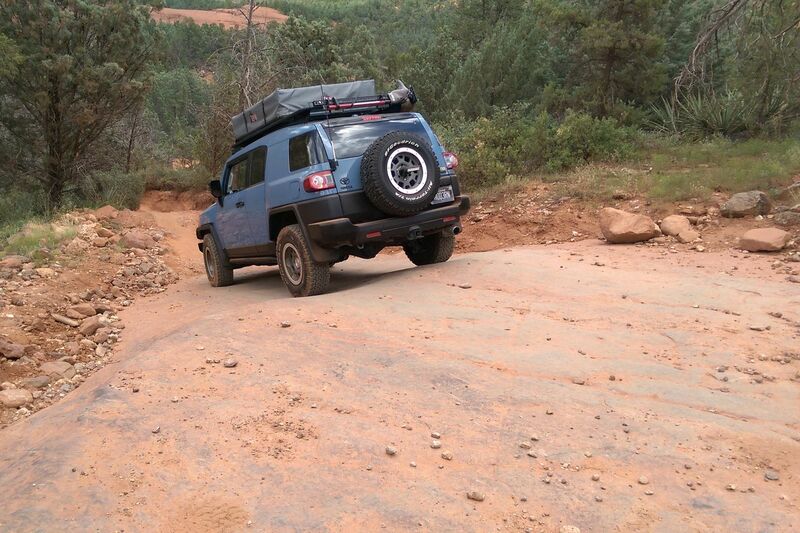 Fortunately, there are lots of pull-out spots along the way that will allow you to let other vehicles go by. The most dangerous part of this hill are the blind corners at both ends of it. Fortunately, at the bottom there's room to pull off to the side to get out of the way of anyone descending. 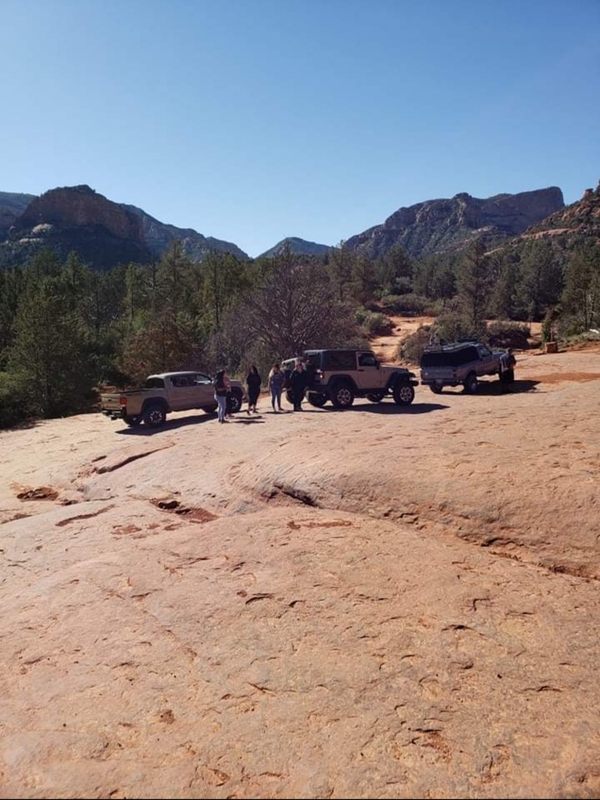 Even better, at the top there is a large area where your entire group can pull out to let others pass; which is good because two-way traffic is common in this area with it being the only way in and out of the most scenic part of this off-road trail. 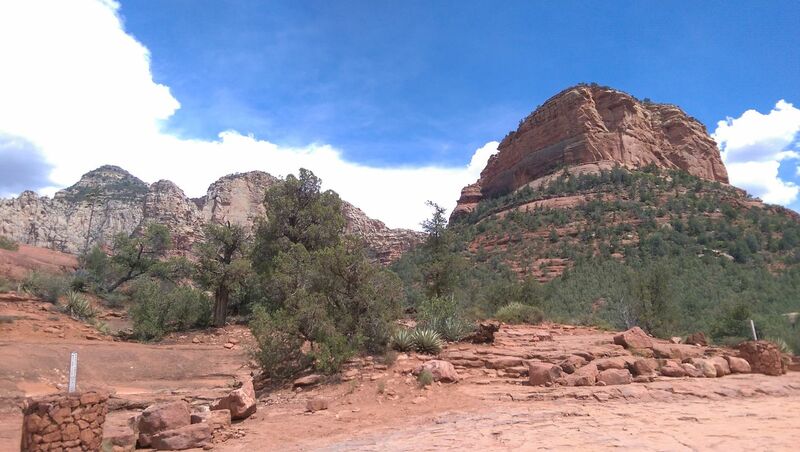 This spot is officially known as Chicken Point (a name that also applies to the broader area), but if your stuck on the name Broken Arrow, you're probably looking for an arrowhead at this point. 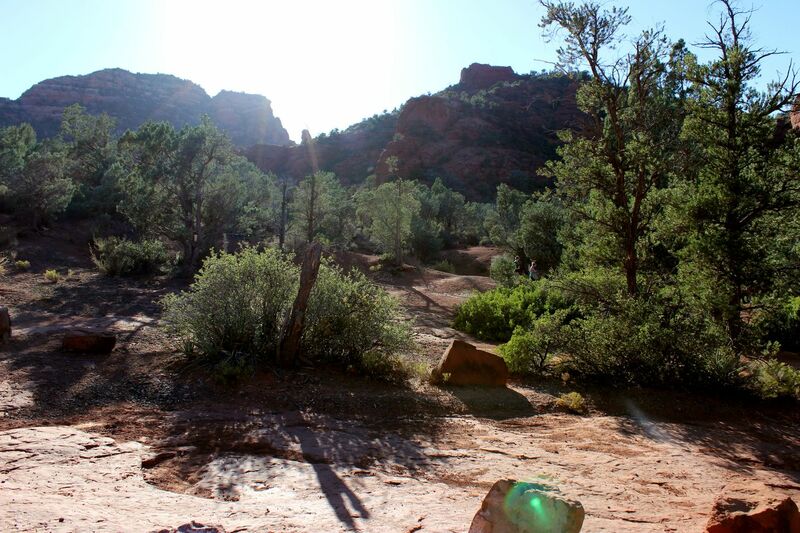 You're in luck because there's a big rock formation shaped like an arrowhead right at the end of this part of the trail! 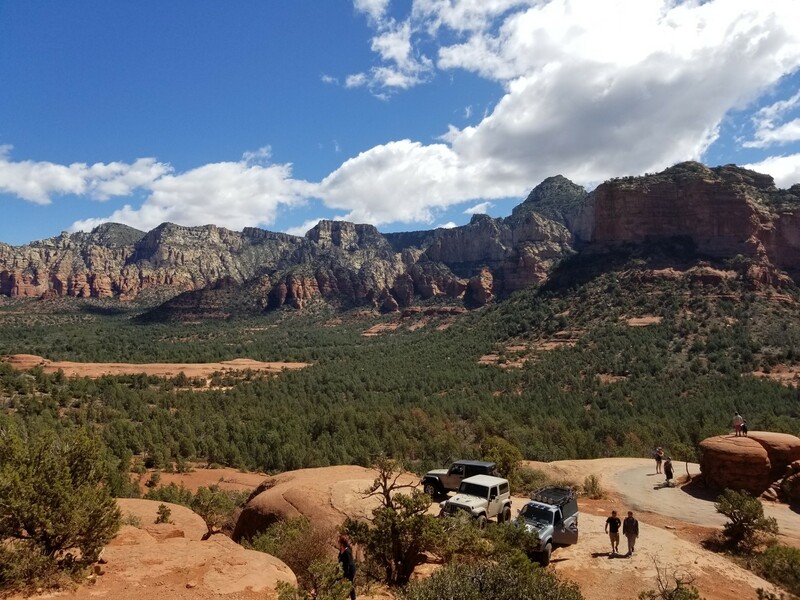 Plan on spending some time here to take in the amazing scenery, after which you'll be heading back to the most challenging part of the trail. 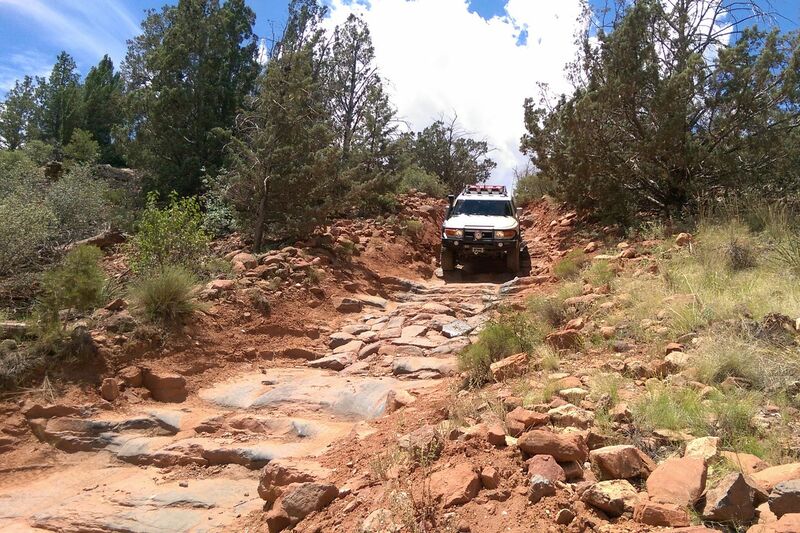 As you head into the more difficult, western splinter, of the Broken Arrow Off-road 4x4 Trail, the first obstacle you encounter is an incline up a large but smooth boulder. However, it's only a small taste of what awaits you ahead. This round-about has a big rock protruding up out of the middle of it, that some people say looks like a mushroom, and thus like to call it Mushroom Rock. You be the judge. 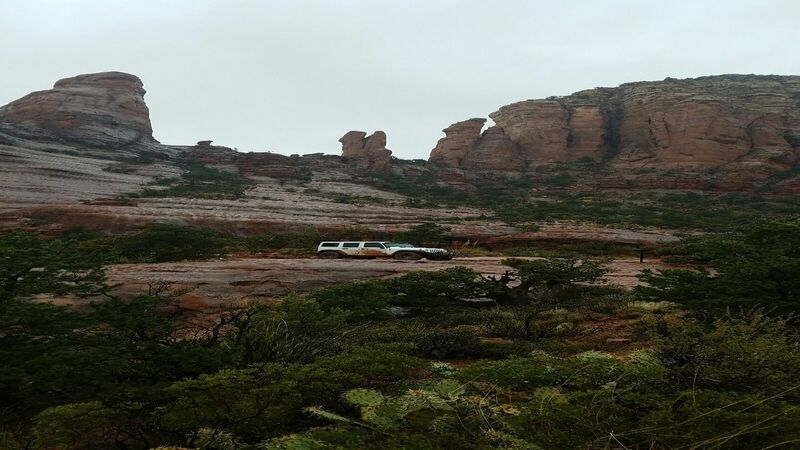 You can get a nice scenic view of Submarine Rock - and the surrounding cliffs - from here that will help you better understand why it's called Submarine Rock (in case you haven't figured it out by now). 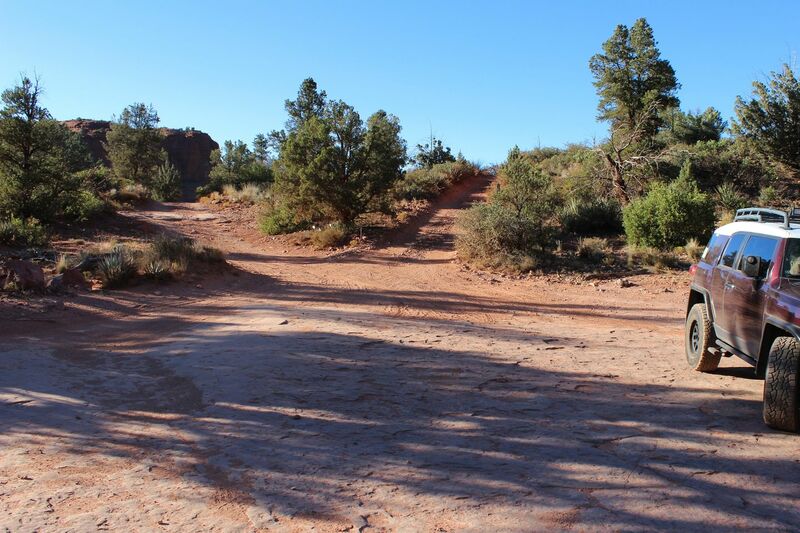 This area, that technically starts at the boulder climb, is full of red slick rock formations and one particularly short, but challenging hill climb (or descent if you're in a Pink Jeep). 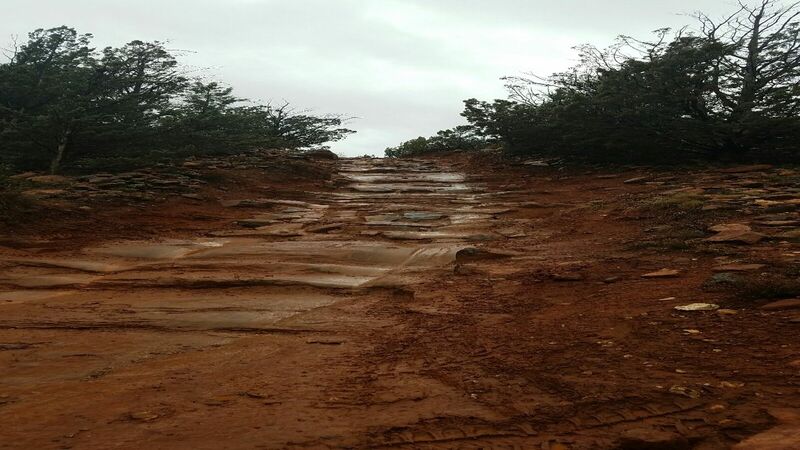 There are also steps of various sizes that you get to climb and descend for almost half a mile as you continue to approach the most exciting part of the trail. 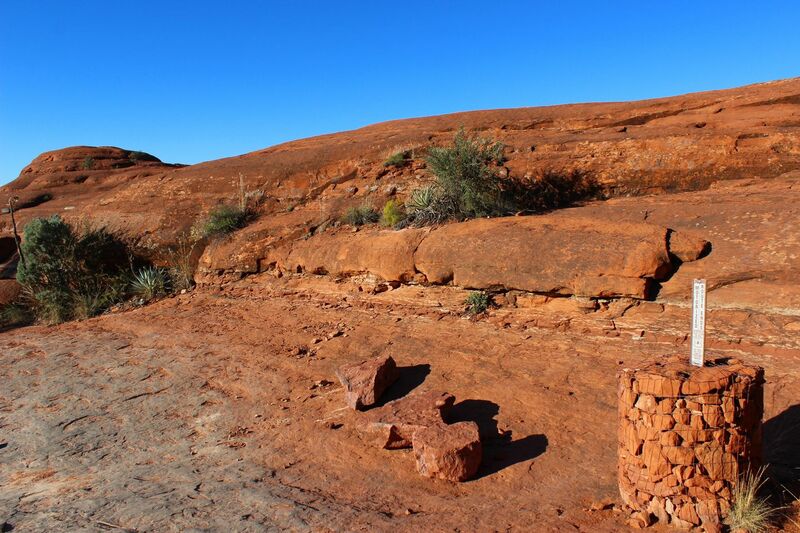 This is the second half of the red slick rock area. It provides more steps and crevices to navigate but don't get too comfortable after making it through this area; the hardest part is yet to come. 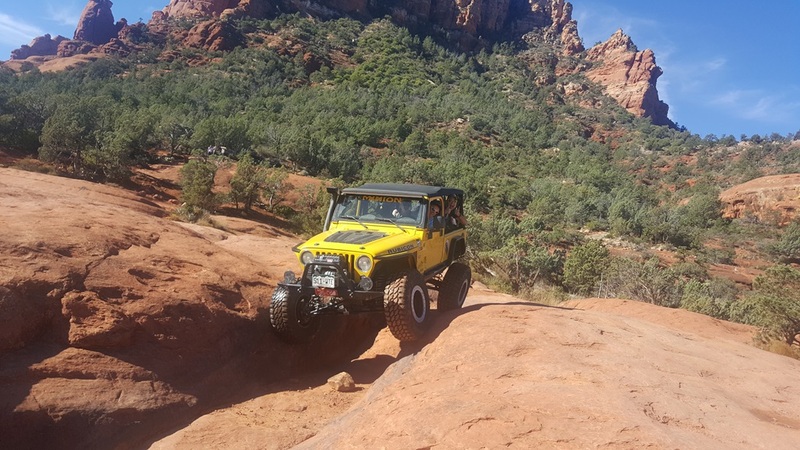 The most challenging thing about these steps, besides looking like an ominous rock crawling cliff, is that they are very steep in a couple of spots. Take it nice and slow. If your vehicle has fared well so far, this shouldn't be a problem as long as you stay in the tracks, keep the gears in low, and the foot smoothly on the brake. 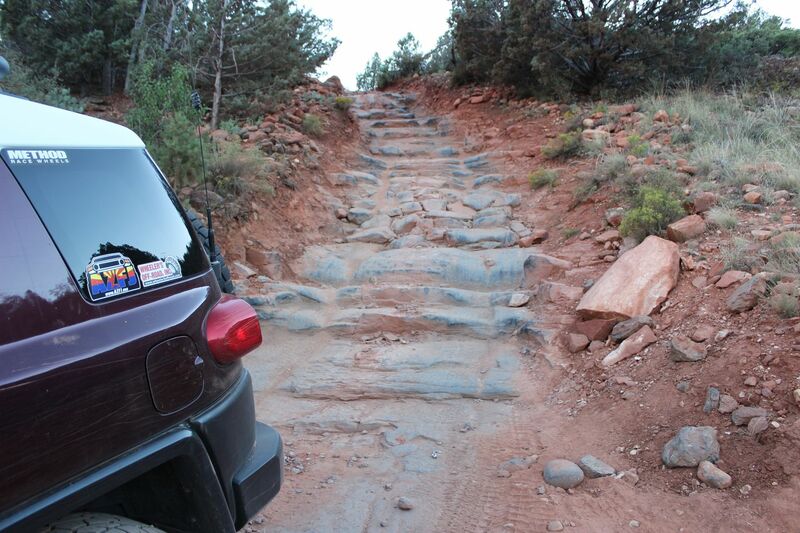 After you get passed these steps, you'll encounter an intersection on part of the off-road trail you've seen before. Turn Left (north) to get back to the trailhead. Just as when you came in, stay to the right as the trail splits. This time, you get to take the other side of the split, as the directional arrow directs you to stay to the right to avoid oncoming traffic. 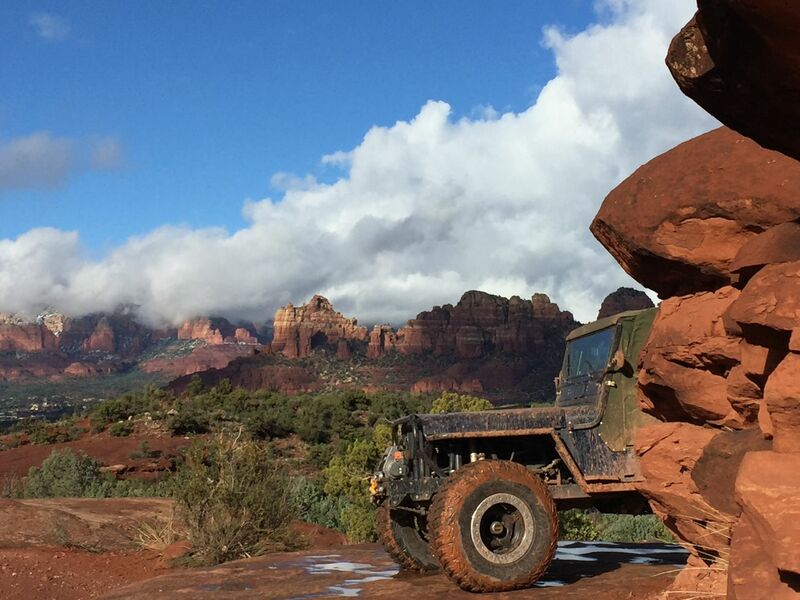 Technically not part of the trail, but certainly worth a look, since you'll be able to park right next to it. You will have to hike up a short but steep hill to get on top of it. 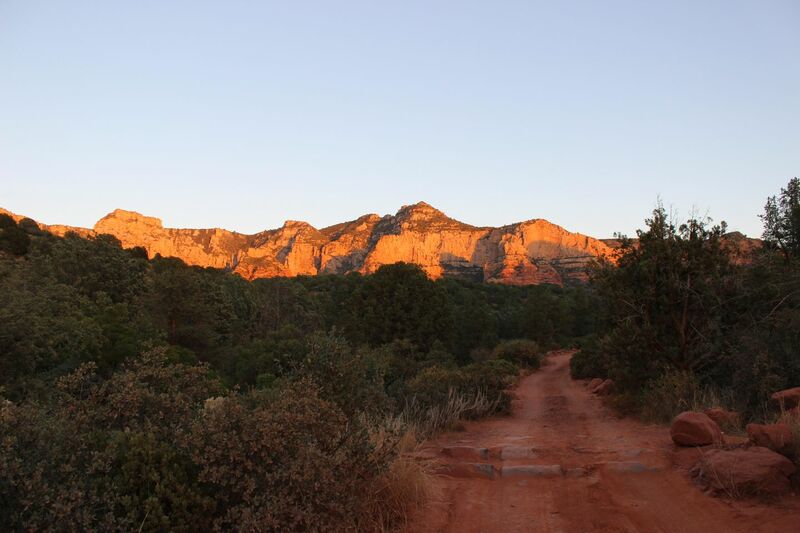 From Highway 179, on the south end of Sedona, turn east onto Morgan Road. After heading straight down the road, through a residential area - just past the second "No Outlet" sign - the road will turn to dirt and you'll find a parking lot on the left. From here you can park and go on a hiking trail, or drive further down FR 179F into some exceptionally beautiful scenery and challenging 4x4 driving. 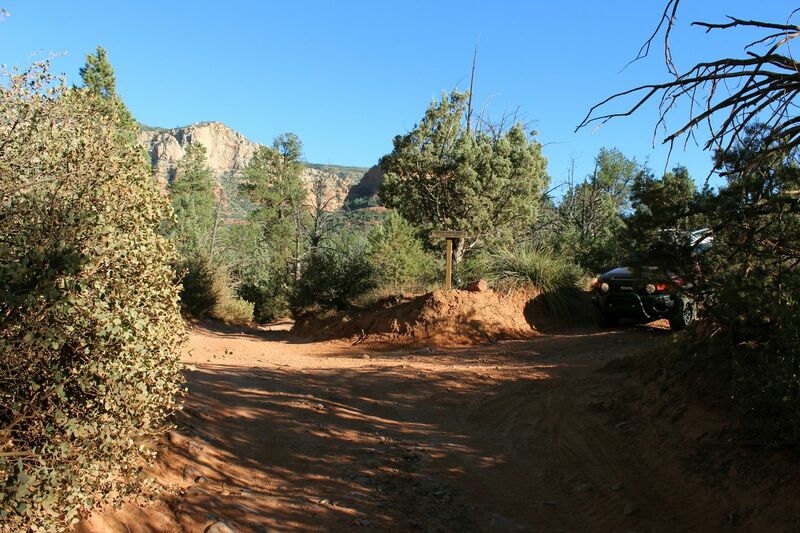 There is no camping along this trail, nor anywhere within Sedona; however, you can find primitive and not so primitive camping areas throughout Coconino National Forest. 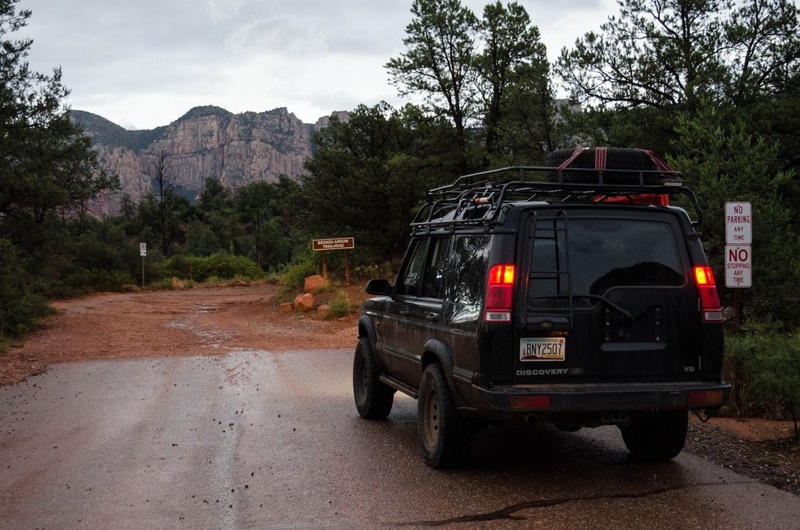 Many other areas, a little ways outside of Sedona (including along some of the "Nearby Trails"), offer dispersed camping just off the dirt roads and trails with no fees or permits required. 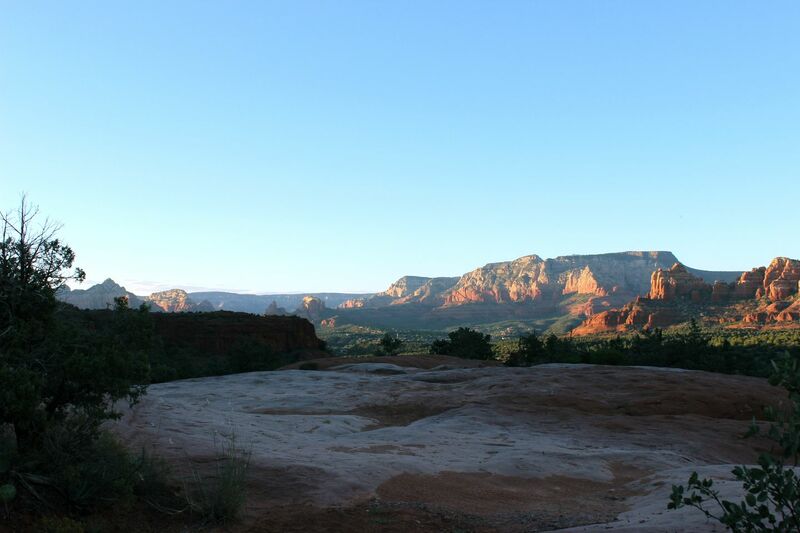 There are also hotels within Sedona and other nearby towns, some of which are high-end tourist attractions with very little parking. 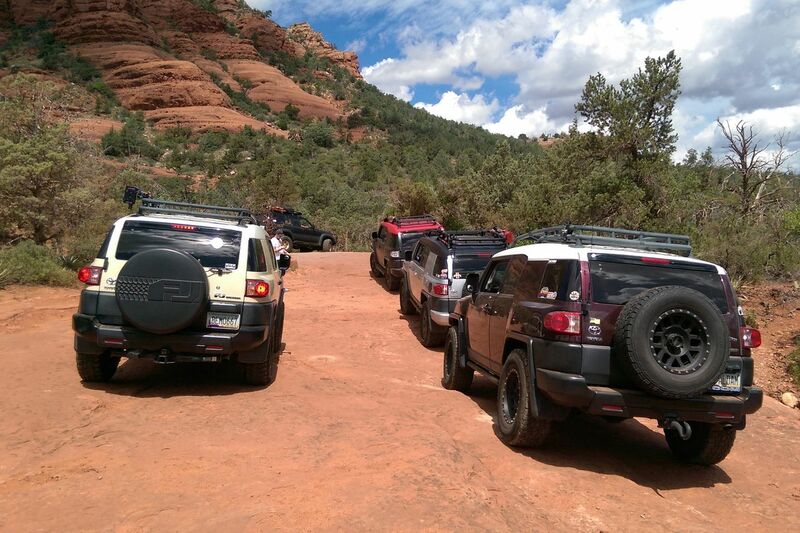 Making finding a parking spot in downtown Sedona somewhat difficult; especially on weekends. As the only way into and out of Broken Arrow is through an otherwise quiet residential area, you'll want to be observant of the traffic laws. Residents have been known to complain about heavy traffic caused by 4x4 vehicles and have even joined together to try and get the forest road closed, so be respectful as you make your way on the pavement. I've been writing for TrailsOffroad since August 2015. 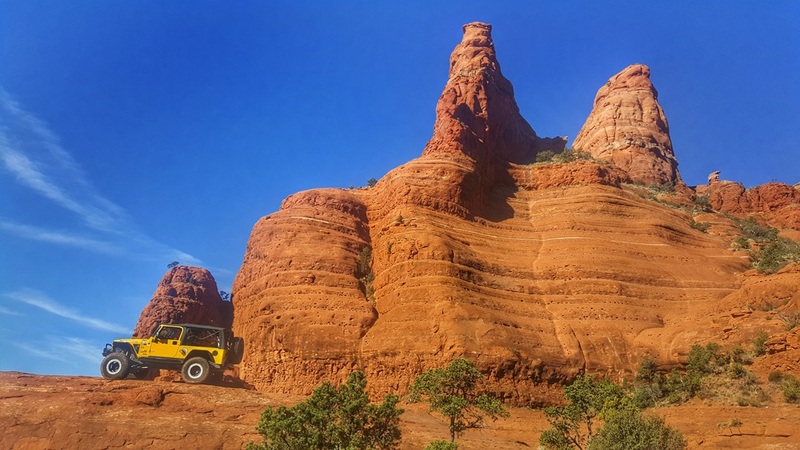 Before that, I had been off-road in places like central and northern Utah, east and west Texas, and central and northern Arizona. I've even driven off-road on an island in the Caribbean (the one time I've driven a Jeep off-road). 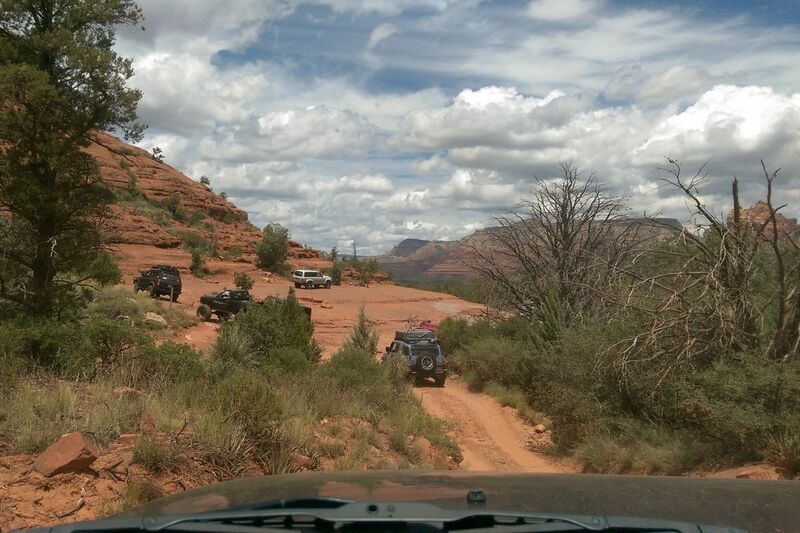 I joined TrailsOffroad because it combines my three favorite hobbies: Off-roading obviously; I've also been blogging for most of my life - even before it was done on the internet (ever heard of a dial-up BBS?) - and even wrote a political column for Examiner.com for a few years; I also have experience with building websites and promoting on social media. 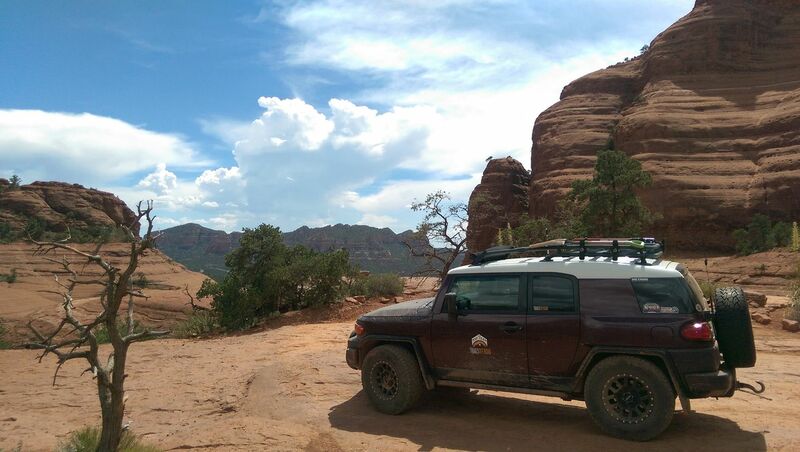 These experiences made writing for Trails Offroad a good fit for me, and I've been enjoying it very much. When I'm not working at my IT job, or playing with my kids, I go on runs with a group of people who like to collaborate on [AZFJ.org](http://azfj.org), and run my own online marketing and web content company (my wife calls it my hobby business) [The Rotisory Foundation](http://rotisory.spaldam.com) (named after a BBS I used to run back in High School and College before the Internet became overwhelmingly popular). I'm a big Toyota fan. 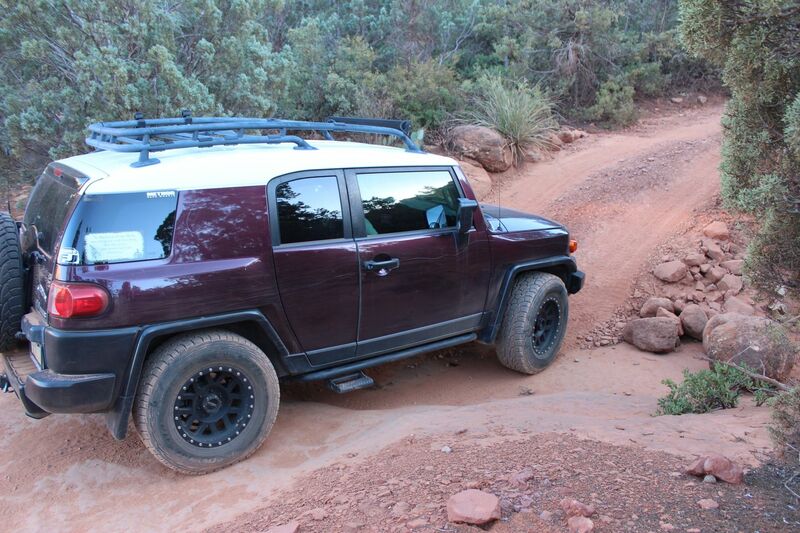 I've owned two 4x4 Tacomas, an older 4x4 Toyota pickup, and I'm now on my second FJ Cruiser (the first was a TRD SE 6 speed, that I got rid of after my twins were born). You can learn more about my adventures at [SJsAdv.com](http://sjsadv.com). A: Yes, it can be done. The main thing you'll likely run into is scraping bottom on some of the hill climbs and descent, especially if you air down your tires. 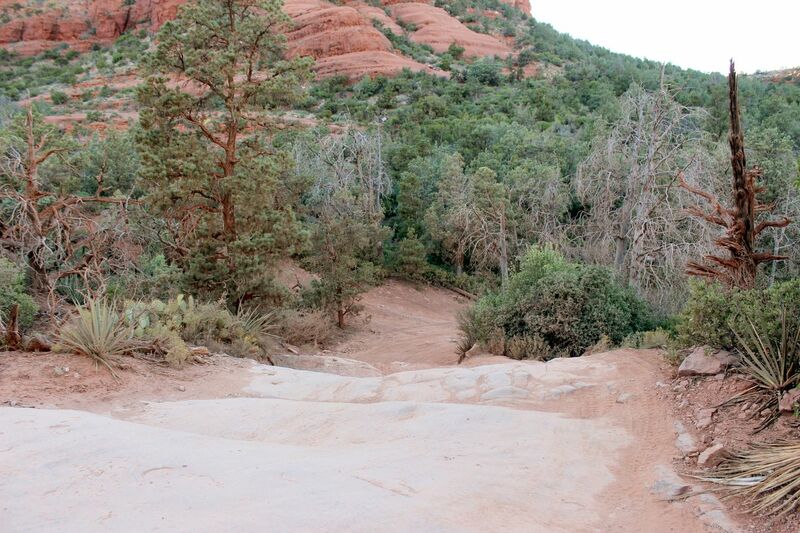 Q: Will a leveled 2nd gen tundra on 35” m/t have any problems on this trail? 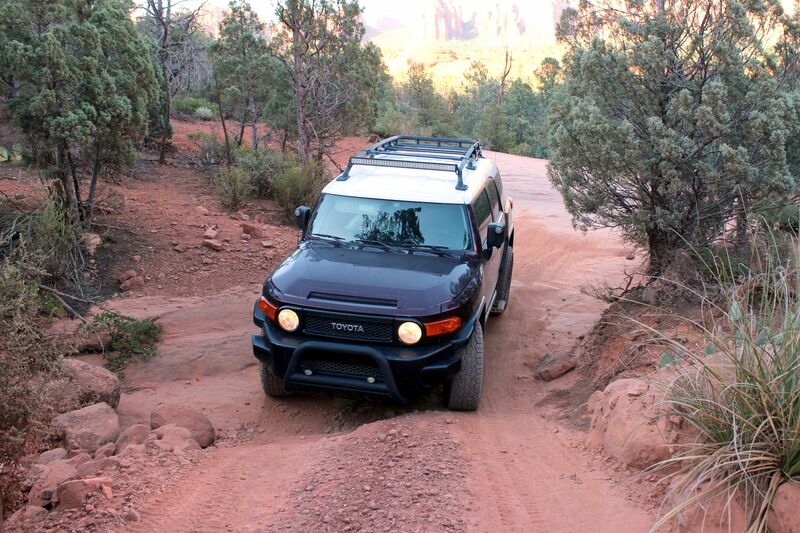 A: I would recommend taking a 4wd. 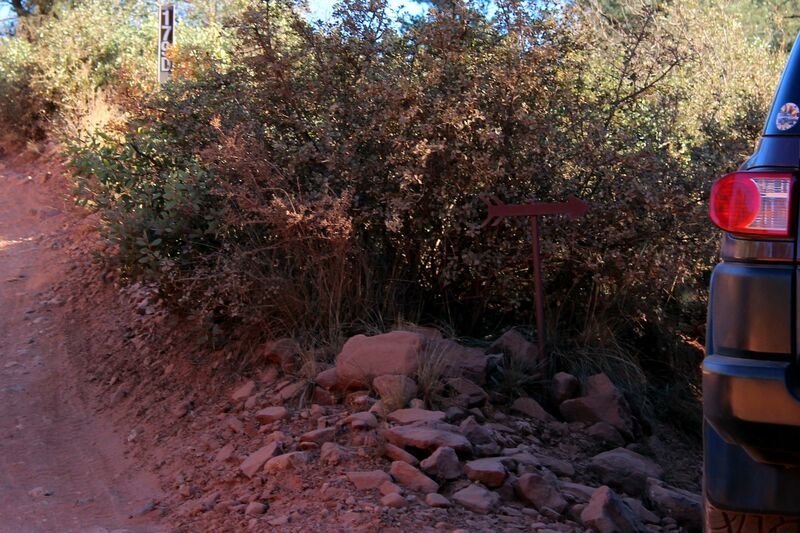 Some of the climbs will likely not be passable without it. Q: I am using my truck and trailer to transport my atv. Where can i park. A: You can park in the parking lot at waypoint 2. As long your trailer isn't huge, you should be fine. Q: So after Devil's stair case, do you have to go back up the stairs to make your way out of the trail? In other words, is this a in and back out trail? A: No you do not have to go back up the stairs. 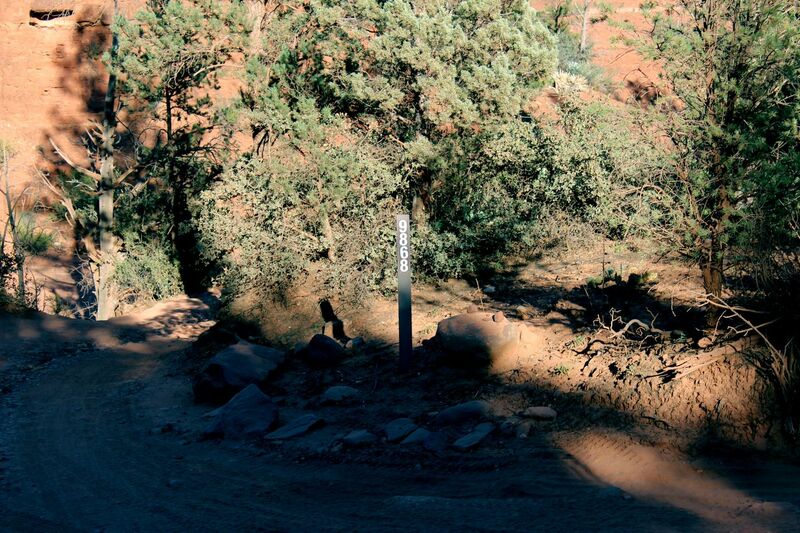 The trail exits to the left at the bottom of the stairs or go right to chicken point. 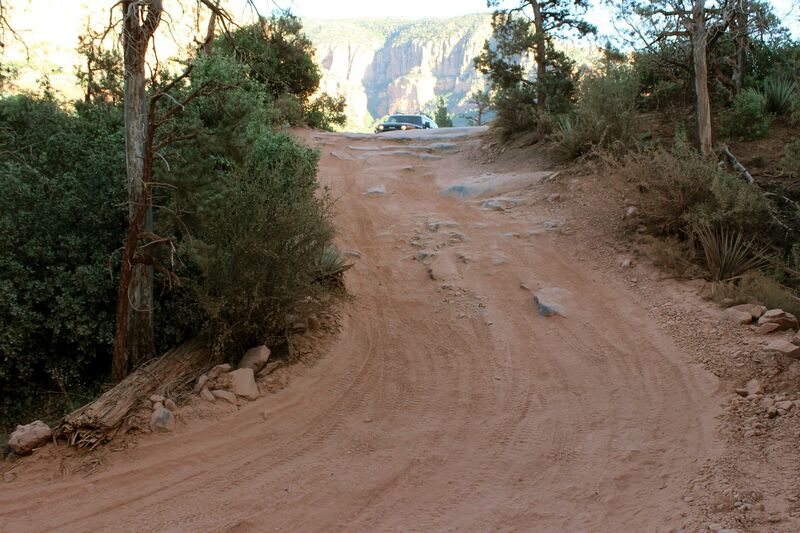 A: Look for trails along the north rim. 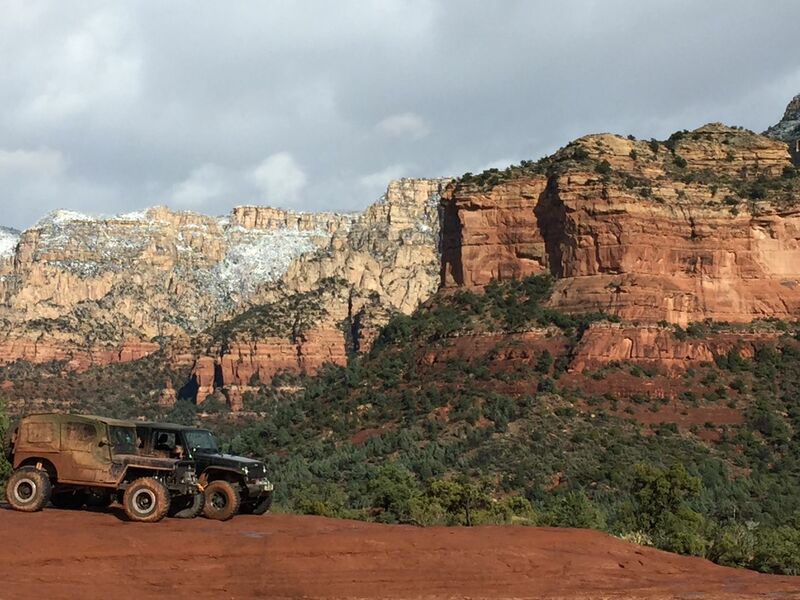 I'm not familiar with the area but I hear the northern side of the grand canyon is great for off-road expeditions. A: Thanks for the info. Looking forward to it. I want to make my trip to Arizona worthwhile. 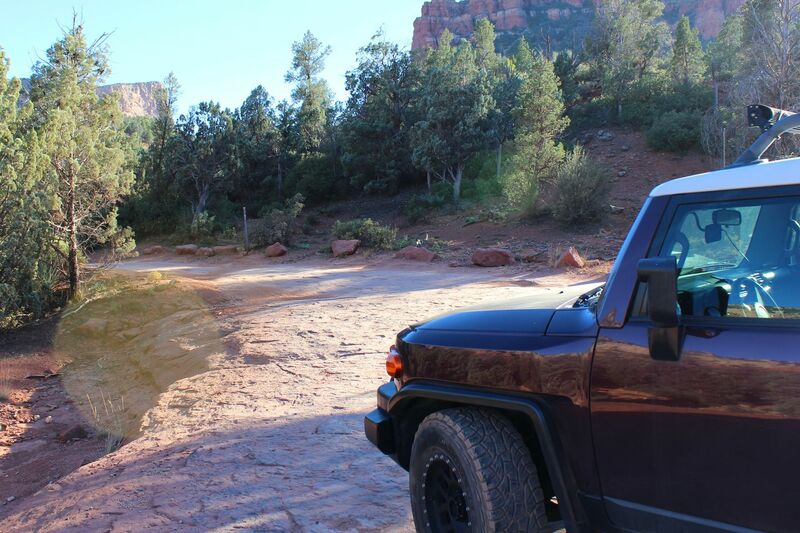 Do you have any trails that will get me to the Colorado River and up close and personal to the Grand Canyon? I heard about driving through Diamond Creek Rd. If that is the only trail with vehicle access to the river, is a permit required? If so, how would I obtain a permit? A: Going back up Devil's Staircase is not required, and actually is considered the wrong way to go. You continue forward until you come to an intersection, which you will have already passed on your way in. Turn left to head back out to the trailhead. 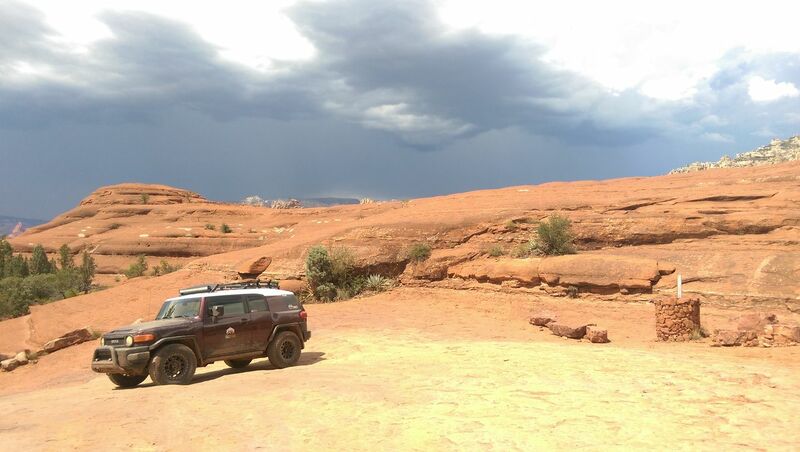 Q: Looking at possibly taking my stock 2016 4runner on this trail. Do you think there would be any issues? A: As long as you have a minimum of a 8 1/2 inch clearance from your front and back differentials and travel in 4 wheel low you should be ok. I did this trail in my Jeep Wrangler when it was stock height. 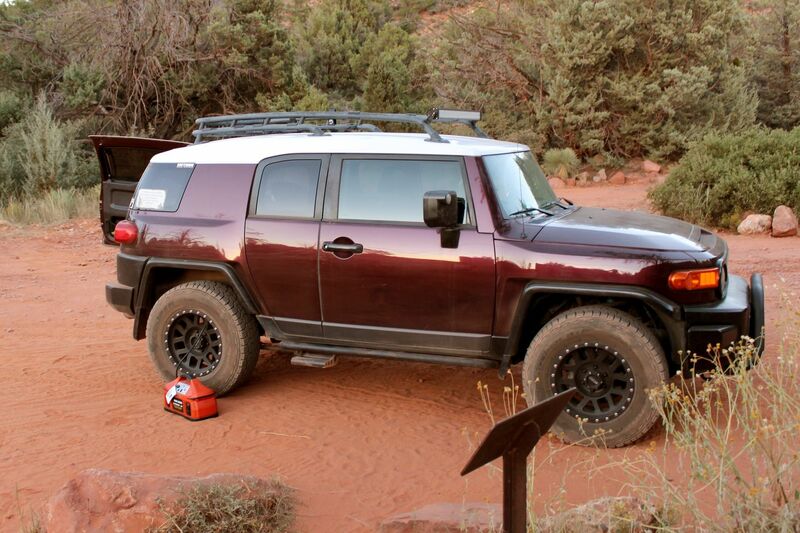 I would also recommend upgrading tires from stock to something like a all terrain with descent blocks. 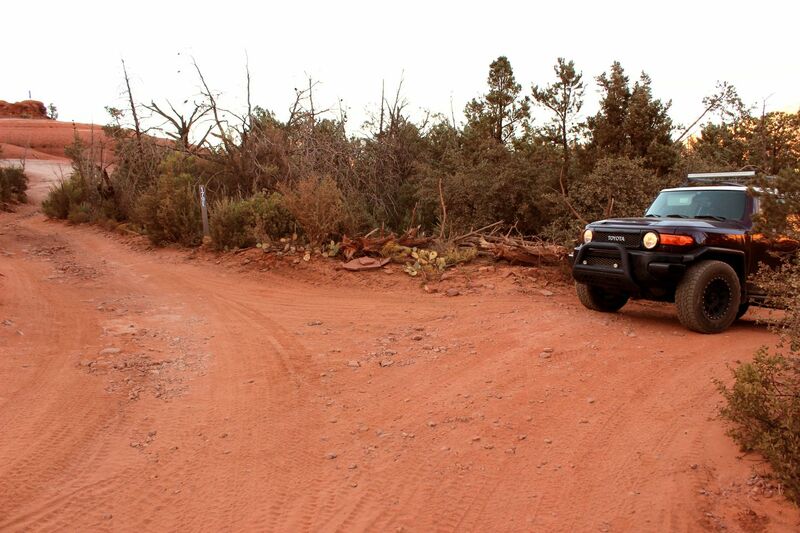 A: As long as it's four-wheel drive you should be okay. 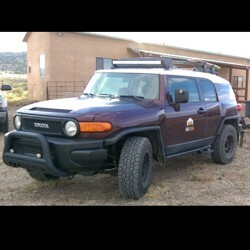 You may find a few spots were you'll have minor clearance issues, but I've taken my FJ Cruiser on it when it was completely stock. I just scraped the skid plates in a few spots. 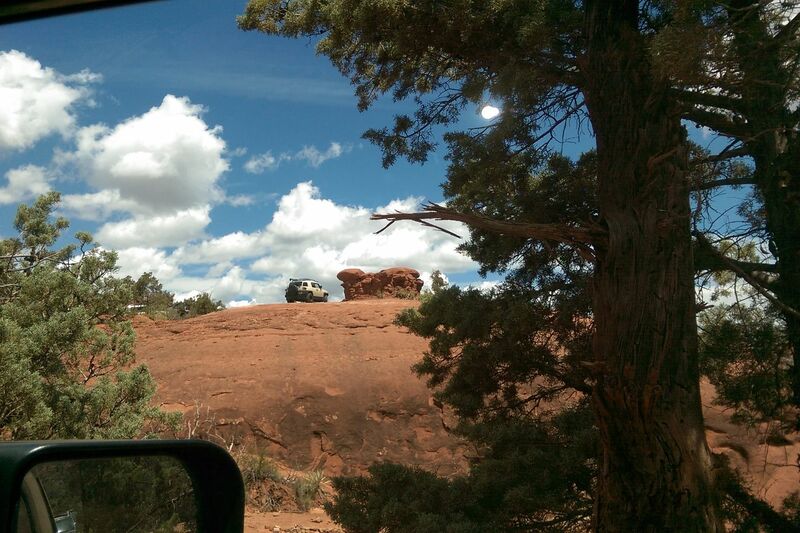 Q: Have you seen any stock f250s rolling through? A: I have seen a group of F-150's going up there for Ford advertisement, they did have a few issues with ground clearance, but luckily their trucks were fitted with some aftermarket skid plates. I would probably advise against taking a stock F-250 out there as there are a few short but steep inclines that may not be ideal for a longer wheel-based truck. Hope this helps! 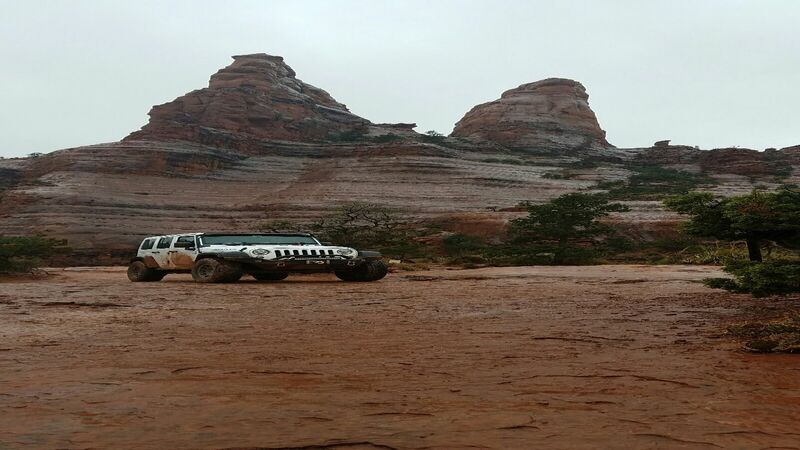 Q: I have a 2008 f250 4x4 it's leveled and has 33 inch bfg all terrains! Will my truck make it? A: You'll definitely find some spots to be very tight, but you might be okay as long as your extra careful. This was a beautiful trail. 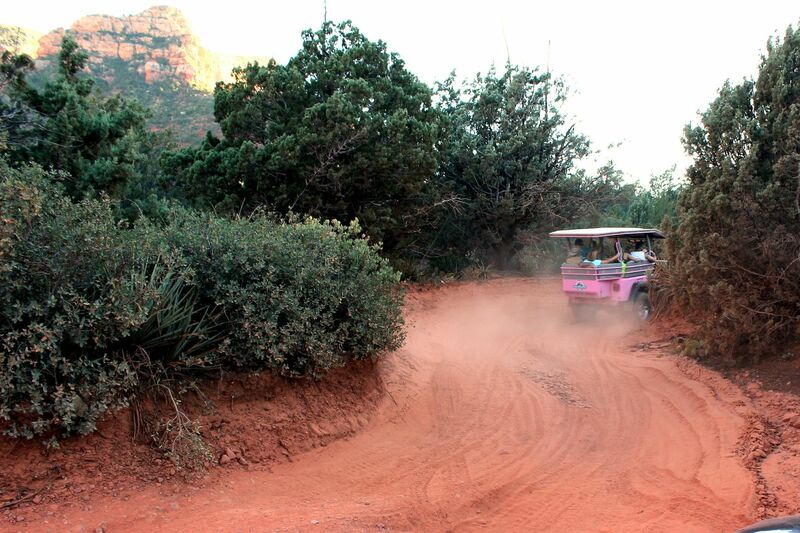 This is a pretty quick trail, but can take longer due to the pink Jeep tours. We started the trail early in the morning to avoid heavy traffic on the trail. Definitely try going down Devil's Staircase, lots of fun. Will be going back soon. Very nice trail. Lots of traffic. If you do this on a weekend be prepared for a lot of traffic. Didn't do all the trail do to time constants. Fantastic scenery. Beautiful scenery! 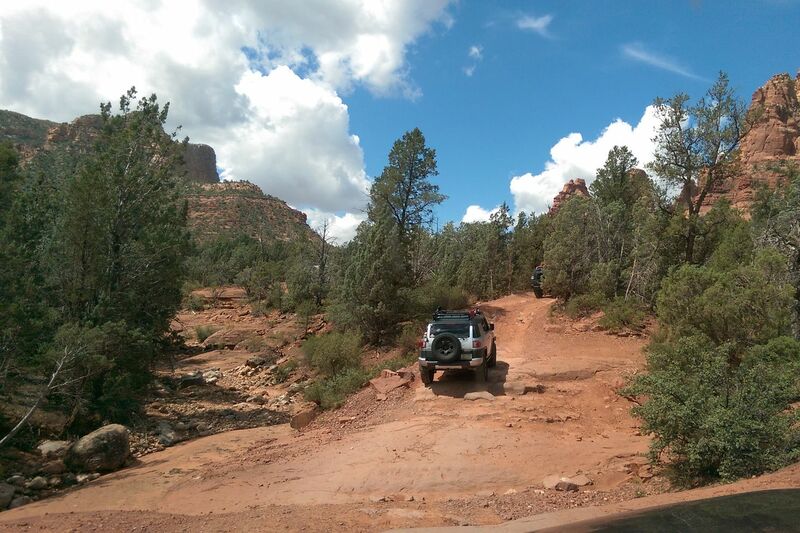 We drive a well built jeep so this trail was not difficult but a few spots added fun. 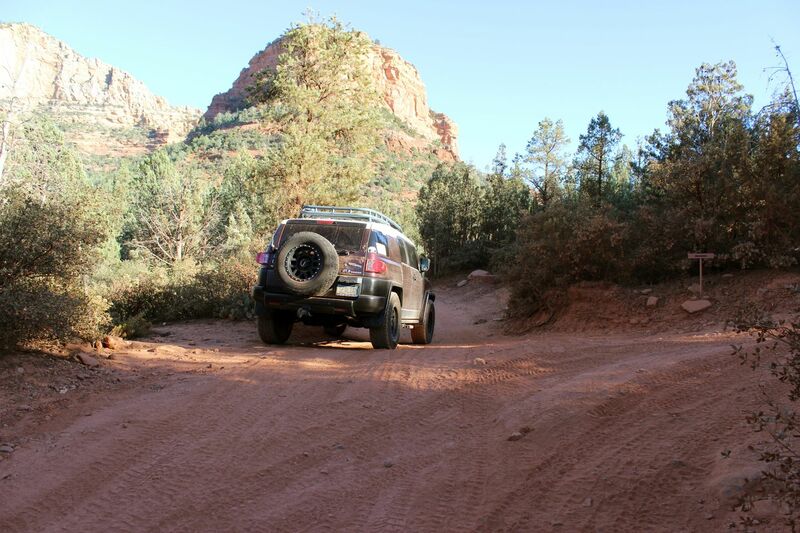 We started the trail around 8am and didn't encounter any other vehicles while on the trail. Even with getting out and walking around at a few spots the whole trip only took us 2 1/4 hours. Most likely because there was no trail traffic. So glad we went early! Love this trail. 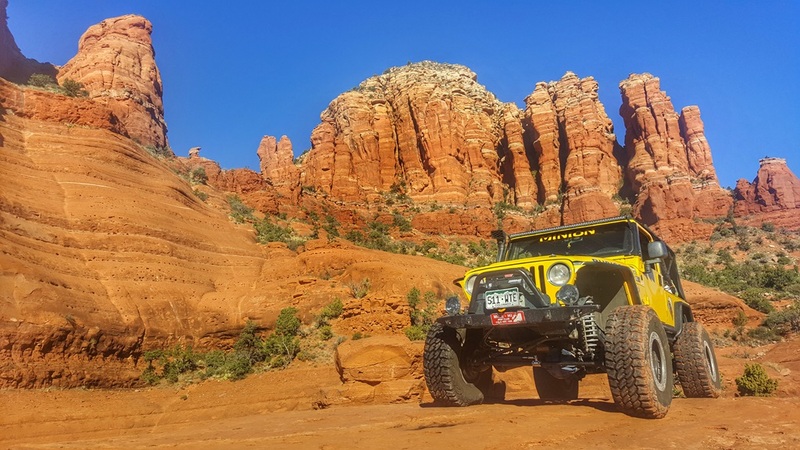 I think this trail is an incredible "starter" trail for everyone new to off-roading who are willing to take their rigs out. 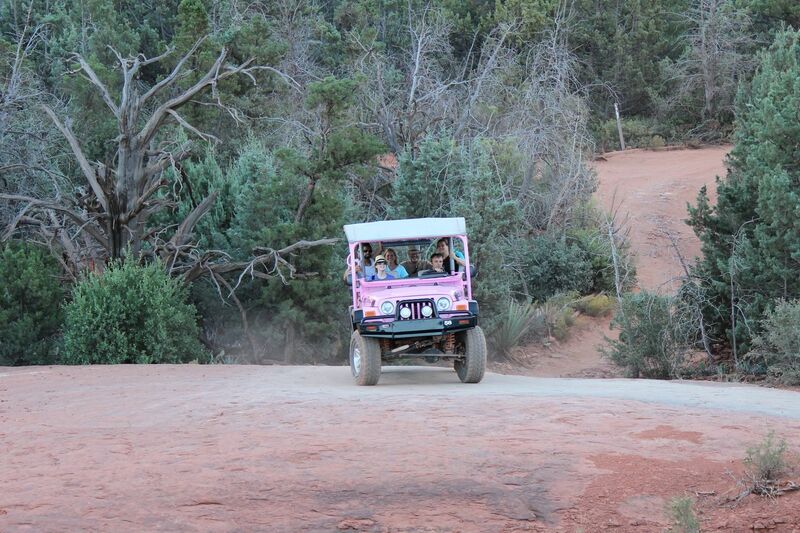 This trail is quick, but can often be slowed down due to the pink Jeep tours. I often try to hit this trail with about 90 minutes of sunlight left, that way the traffic has died down and I can get through it without having to run into a group of "tourists". 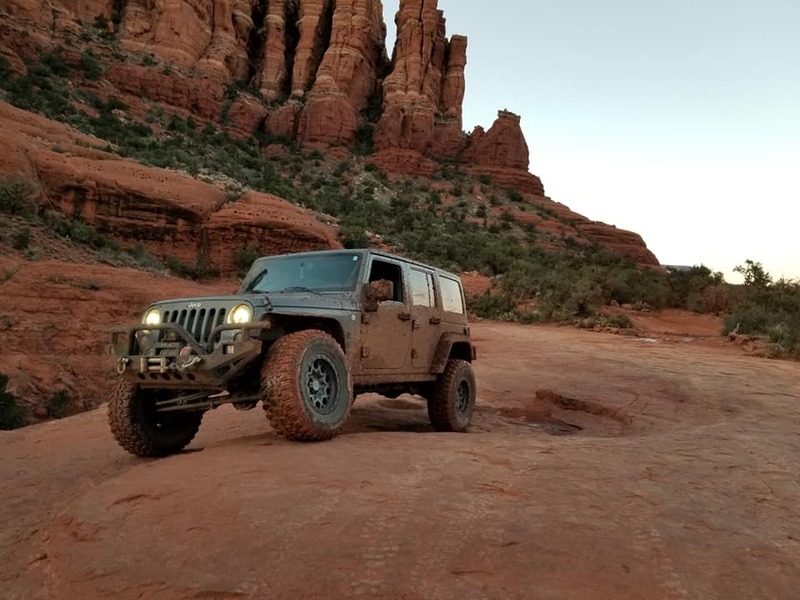 When someone asks me to take them on a trail, this is the one I like to do. 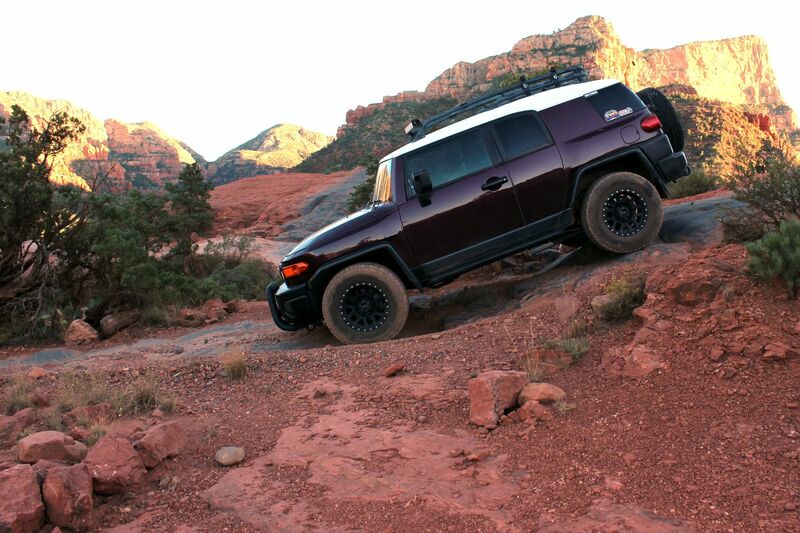 It stretches your flex enough to be cool, but is relatively safe if your wheeling responsibly. 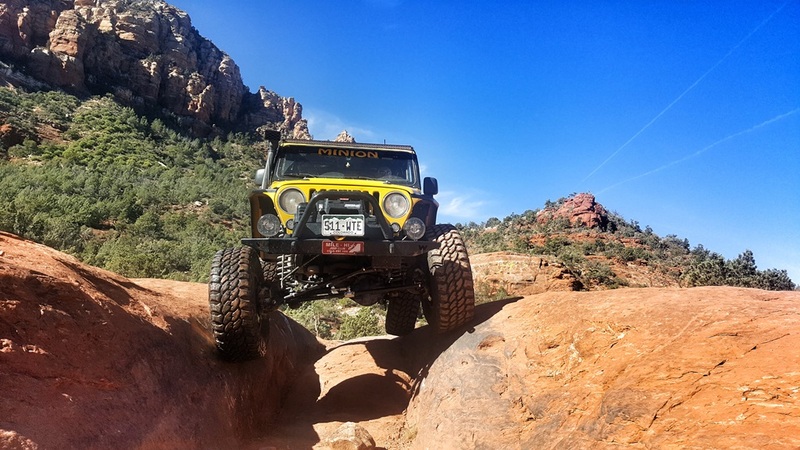 Devils staircase is the only "pucker" factor, but I have a JK with 35s and a 4in lift so it is all about brake control. Anything smaller than that would likely scrap. Love this trail. Especially good for a day taking in the sights and "chilling". Broken Arrow is a fun trail, even in the rain. The rain does makes this trail a bit more challenging though. 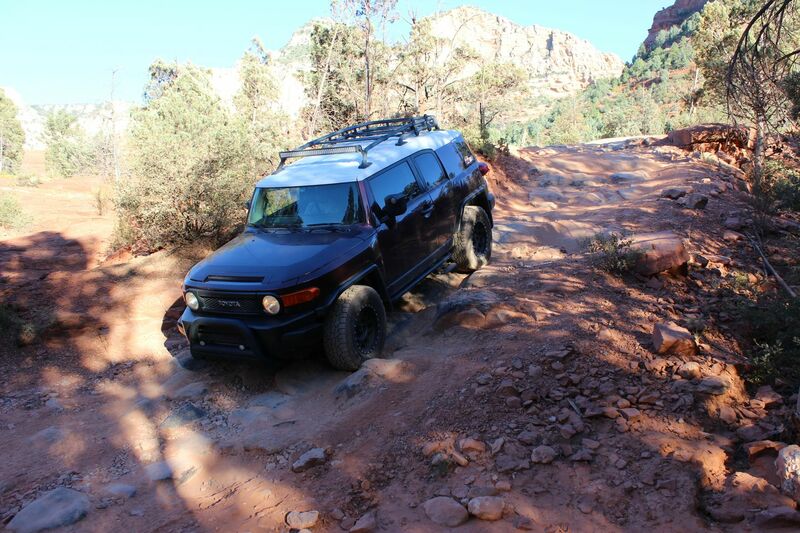 Consider that traction is reduced on slick rock when it's wet, but not so much that it makes it impassible. 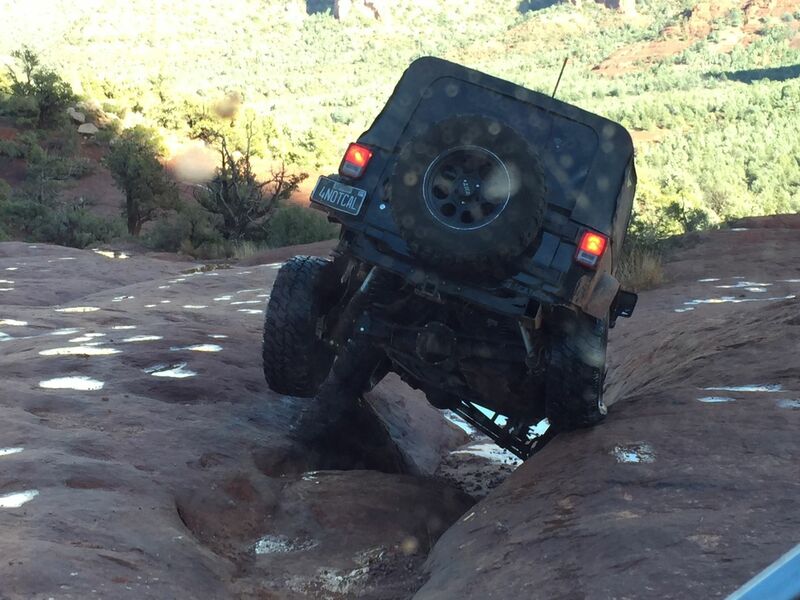 Be sure to air down before attempting this trail when wet. We hit the trailhead at 7pm. 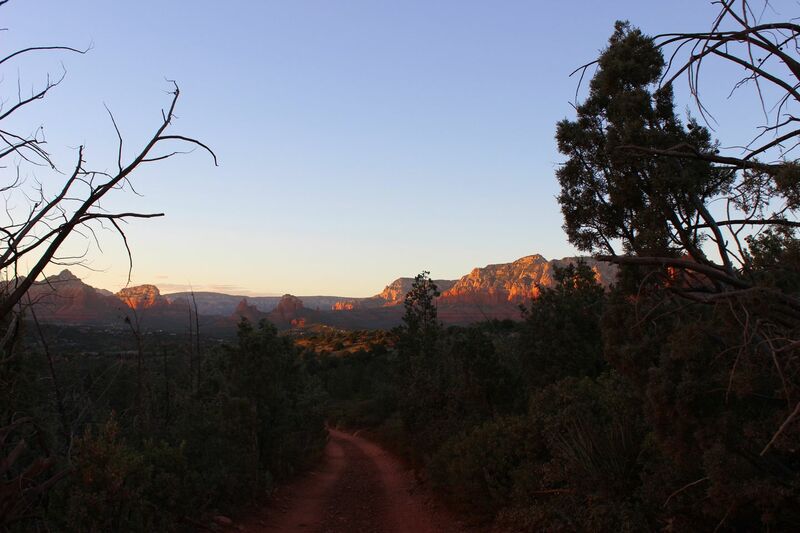 On must summer nights in Sedona, this isn't yet too late. 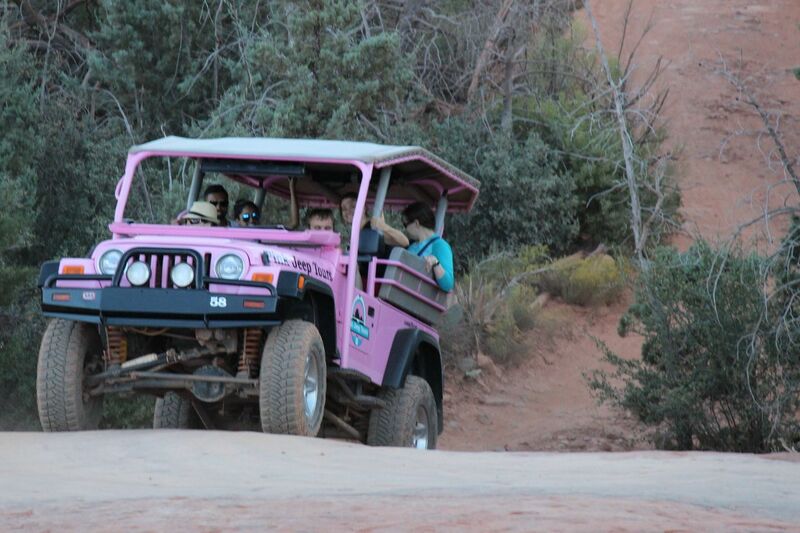 You'll find the Pink Jeep Tours are finishing up their last tours for the day at that time. When it's raining though, you can expect the trail to get dark earlier. This adds to the challenge, making it hard to spot the train in some areas (around waypoint 22). In summary, don't take this trail at night, in the rain, if it is your first time out on Broken Arrow. If you've done it before and are ready for a fun challenge, carry on! 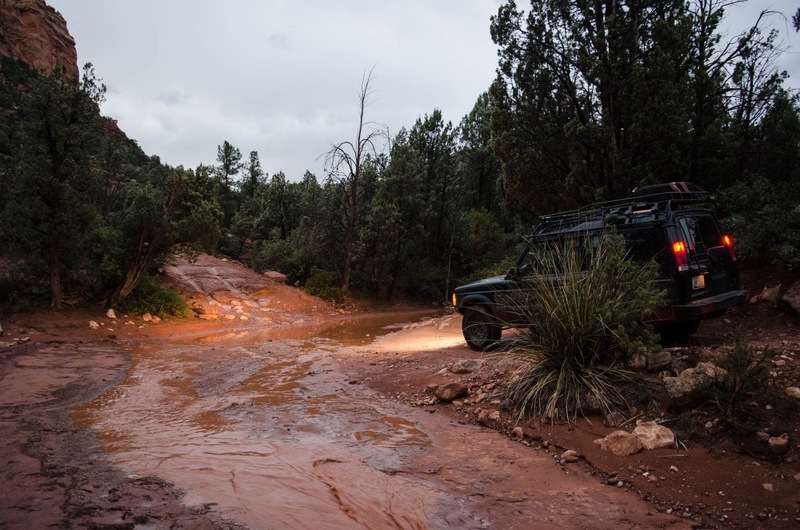 As a final note, don't forget that trails can be damaged when wheeling while wet. 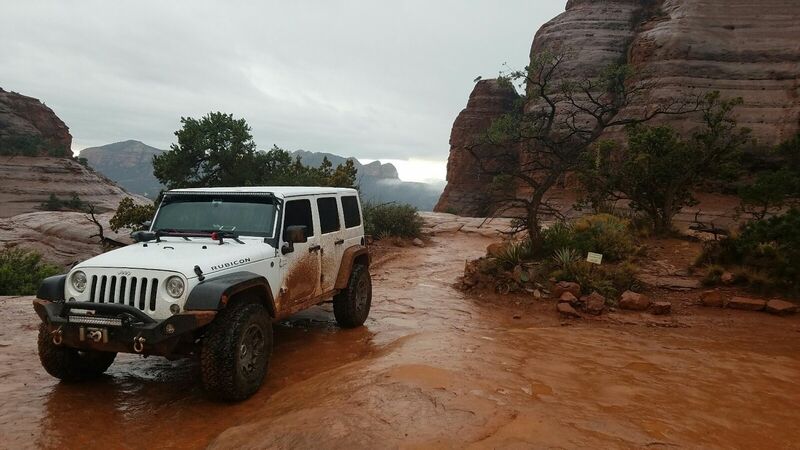 While most of this trail is rock, be sure to follow a Tread Lightly philosophy when on this, or any other Sedona trail, in the rain. 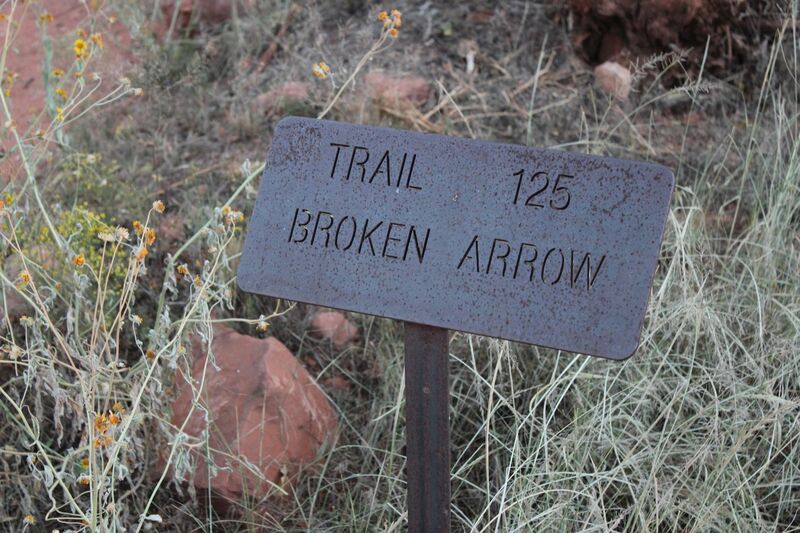 I was in Sedona for a brief overnight stay and had to run the famous "Broken Arrow". I have always seen and heard about it and was really excited to run it myself. 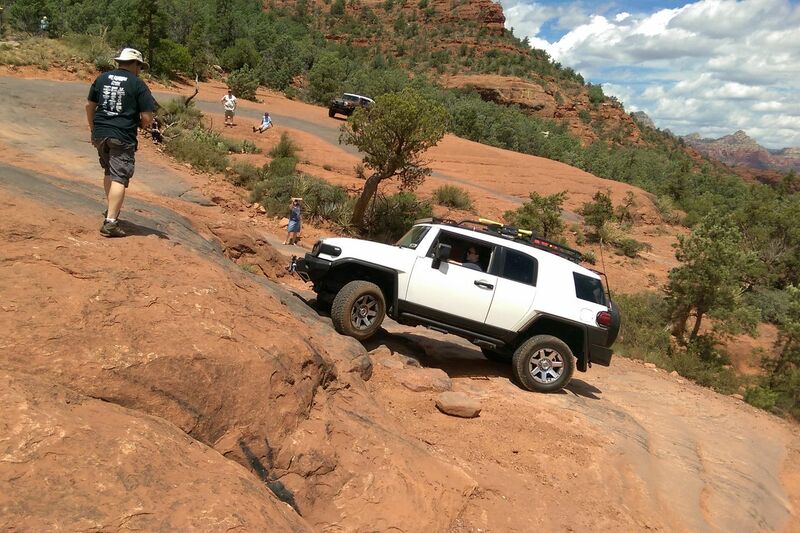 While the trail was fairly easy for a lifted Jeep, the staircase obstacle was the most technical part of the drive. The drive aside, the scenery was beautiful and almost otherworldly. 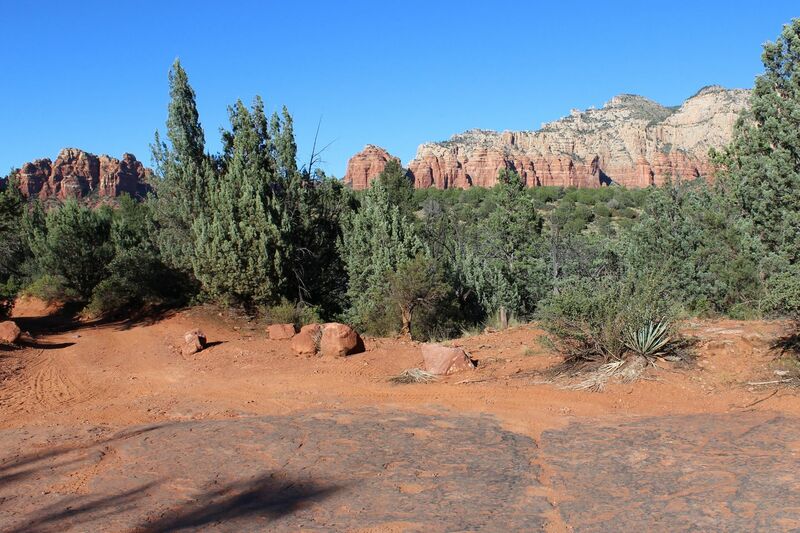 Once back deeper into the trail, I felt a deep calmness come over me and was thinking there might just be something to the vortex phenomena that Sedona is known for! Great day on the trail with wet conditions and plenty of mud to play in. Took my girlfriends 2015 JK up devils staircase - made it to the top but had to use front and rear lockers. I do not advise to go up this obstacle as there are usually other vehicles on the top working there way down. 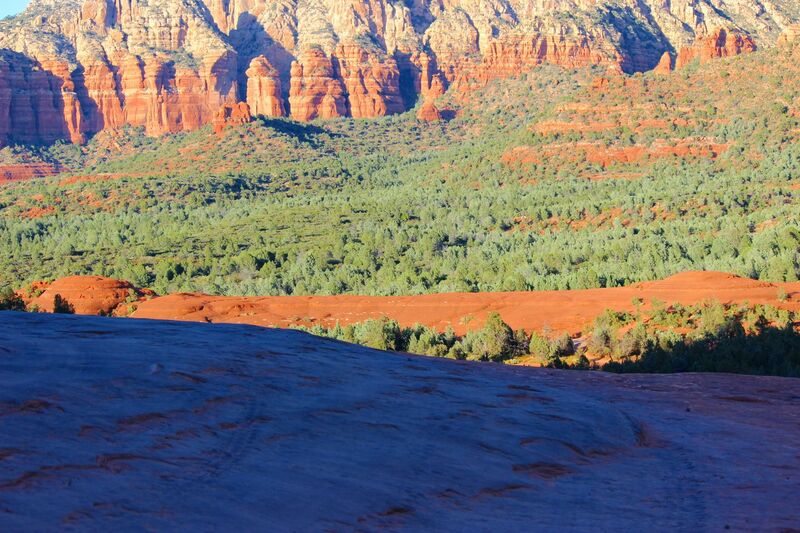 Highly recommend this trail if you visit Sedona as it's one of the best scenery trails around. 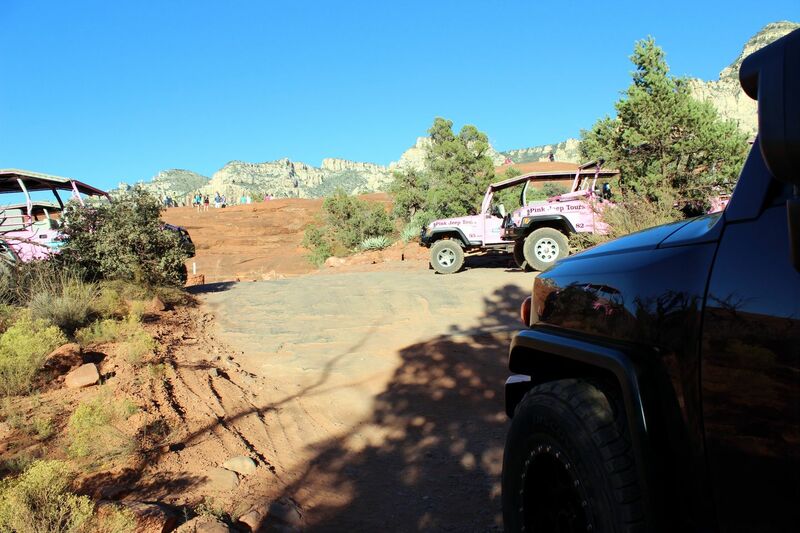 Be aware that the trail is sometimes overrun with the Pink jeep tours, especially during the peak season in the spring and summer. 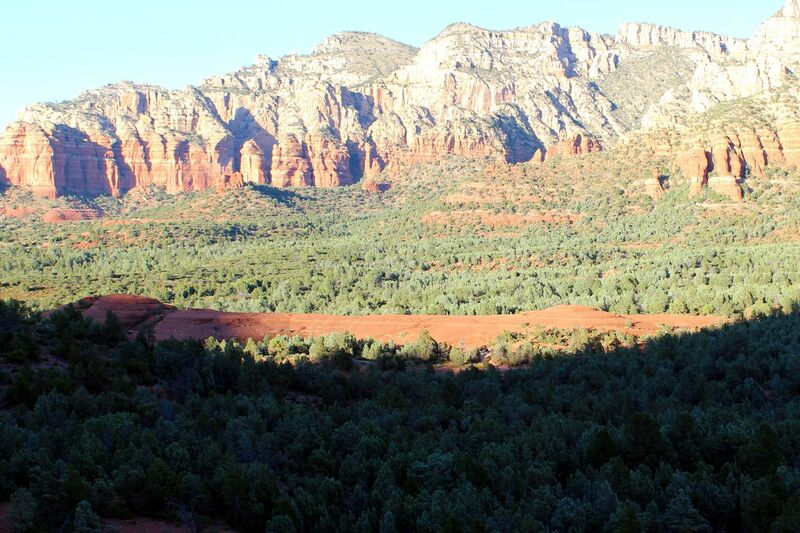 A great February day in Sedona, not too hot, just about right. 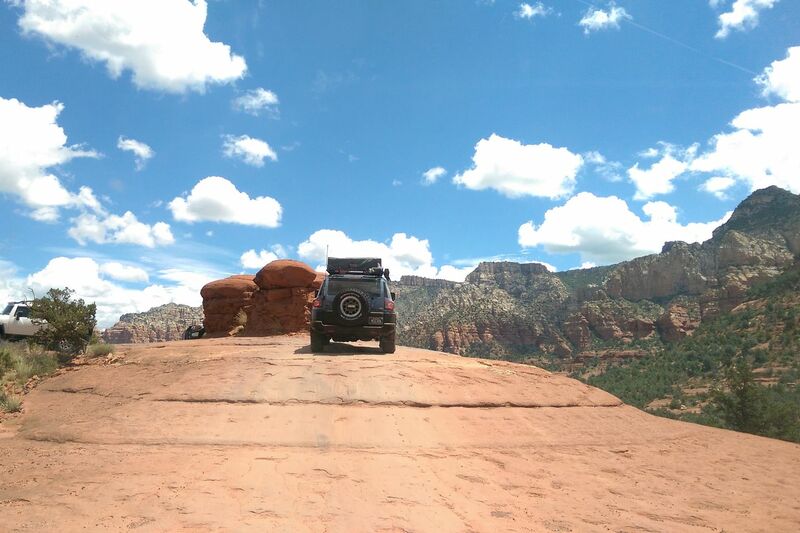 A great trail with a different view at each turn of the road. 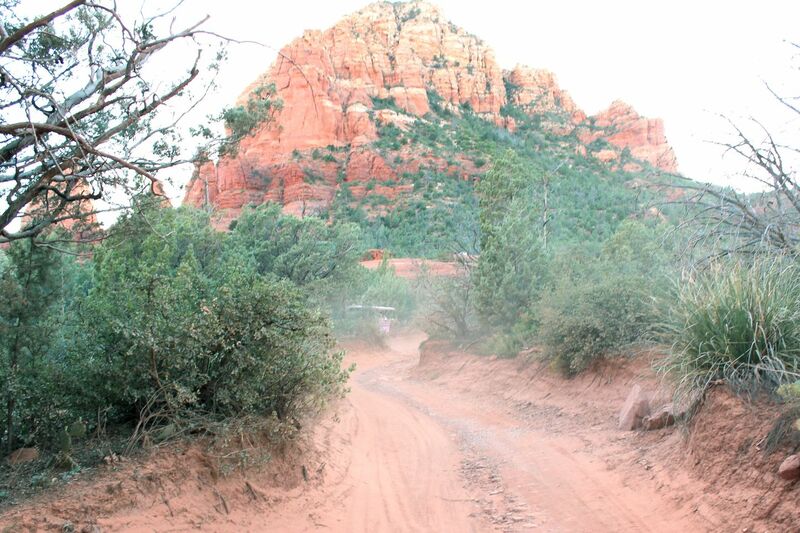 A must do trail in Sedona. Suggest a weekday like we did to avoid some of the outfitter traffic. I had the pleasure of stopping at this trail during my drive down from Colorado. 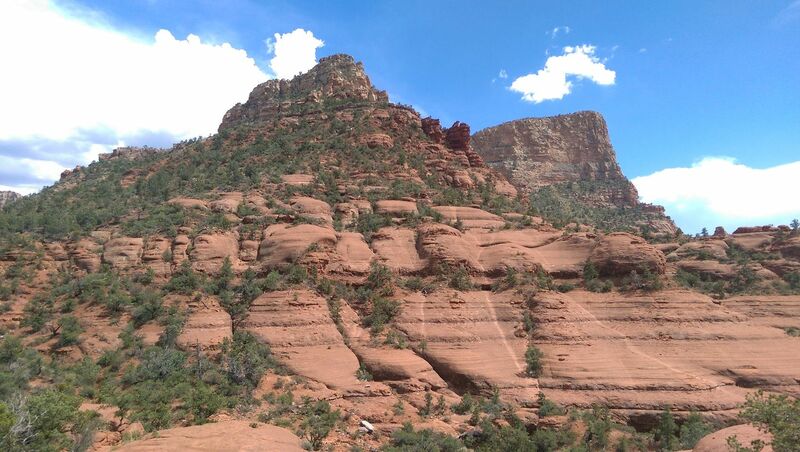 The red rock in the area is truly awesome and reminds me a lot of Moab. 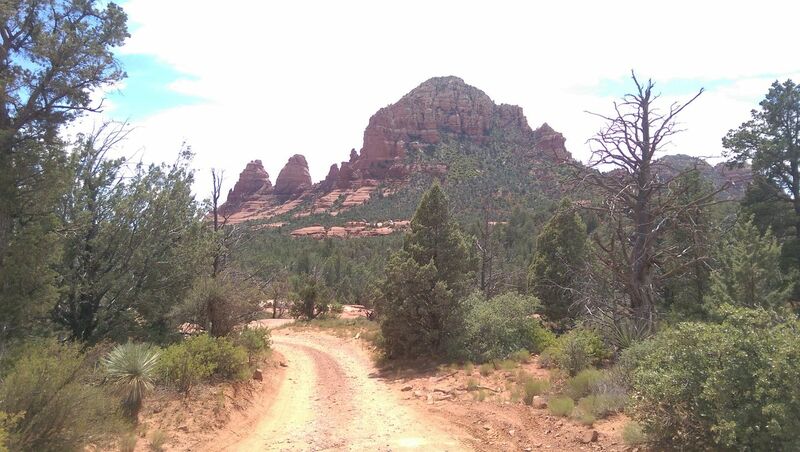 This trail provides a lot of good scenery and a lot of interesting rock formations to see. 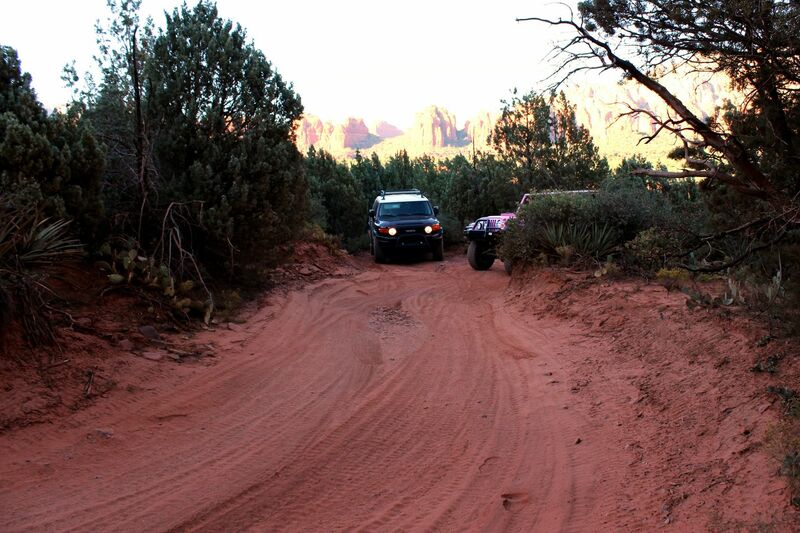 We hit the trail early on a Wednesday morning and saw a lot of hikers and a lot of Pink Jeep traffic. 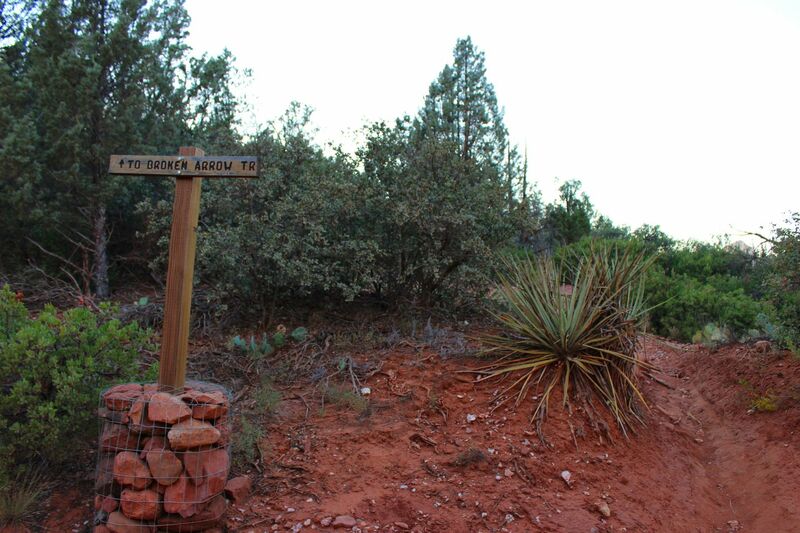 The signage on the trail is in good shape and made it easy to find the right direction to travel. We stopped for a ton of photos and still managed to complete the trail in about an hour and a half. Broken Arrow is not very technical, and in my opinion, andy vehicle with a low end transfer case will have no issues on this trail at all. 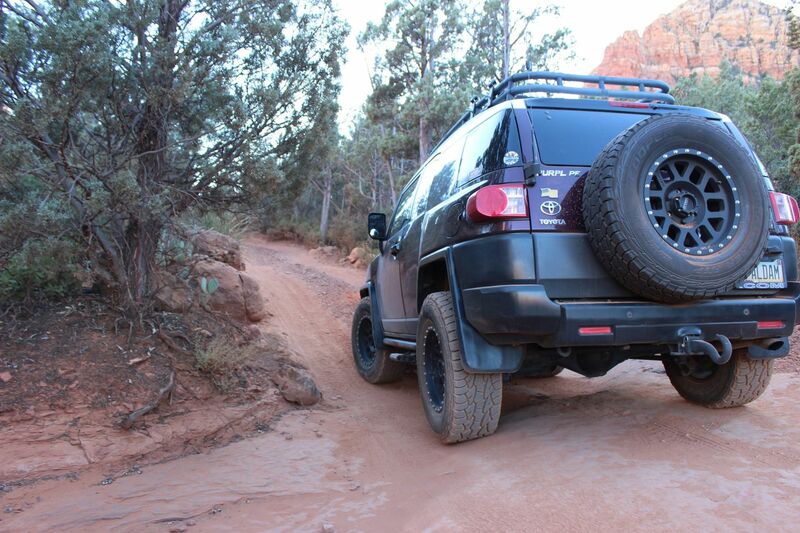 If you do not have a lot of ground clearance just take it slow and steady. You may scrape the undercarriage every now and then, but there are many areas where you can choose from and easy line or a moderate line. It was a bit warm, but the clouds help keep the sun at bay. 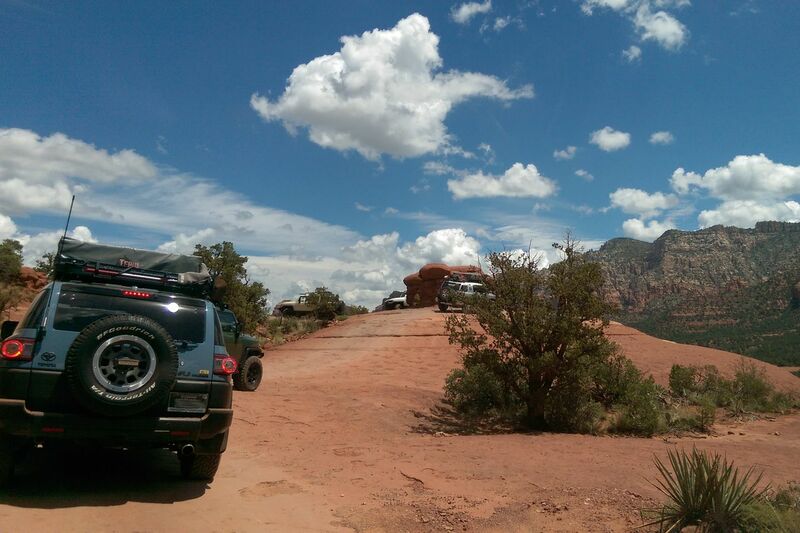 The trail was as beautiful as ever with the red rock formations and the pink jeeps. 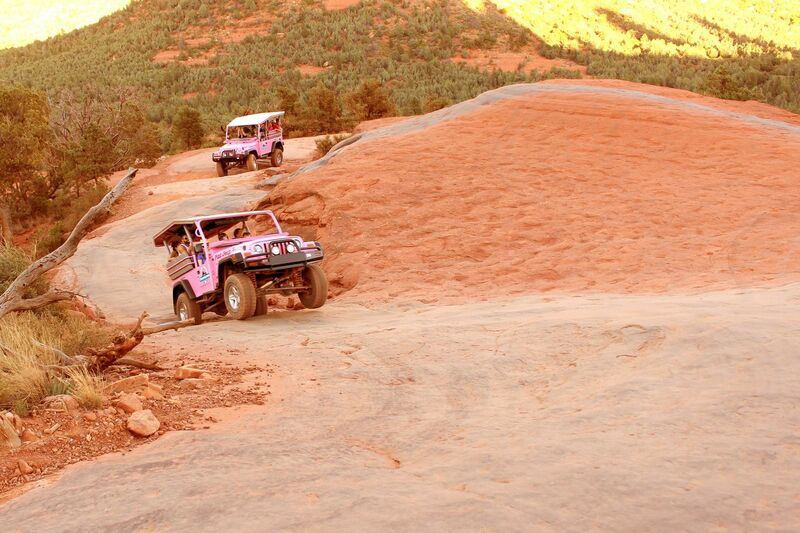 Being a well maintained trail, thanks to the pink jeeps, it hasn't changed much in recent years. Being a Friday afternoon, the trail was otherwise empty, leaving it all to myself to enjoy in a quiet peaceful environment. 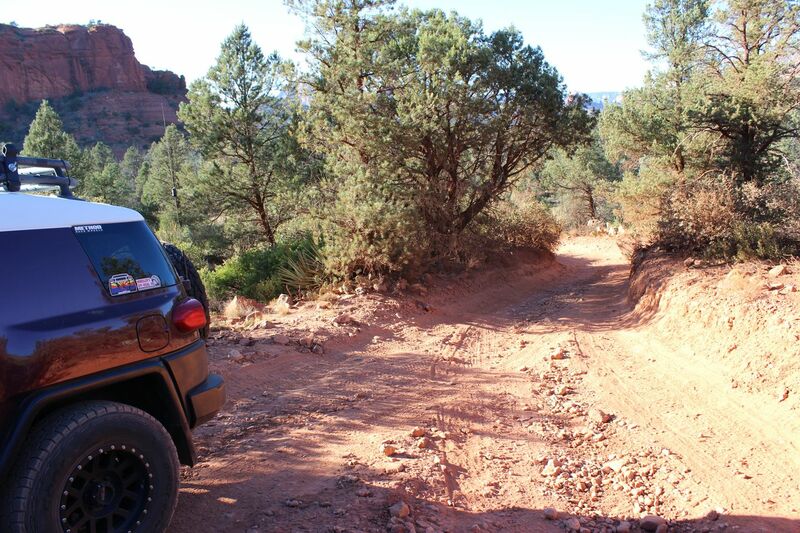 It was a perfect day out on the Broken Arrow trail. 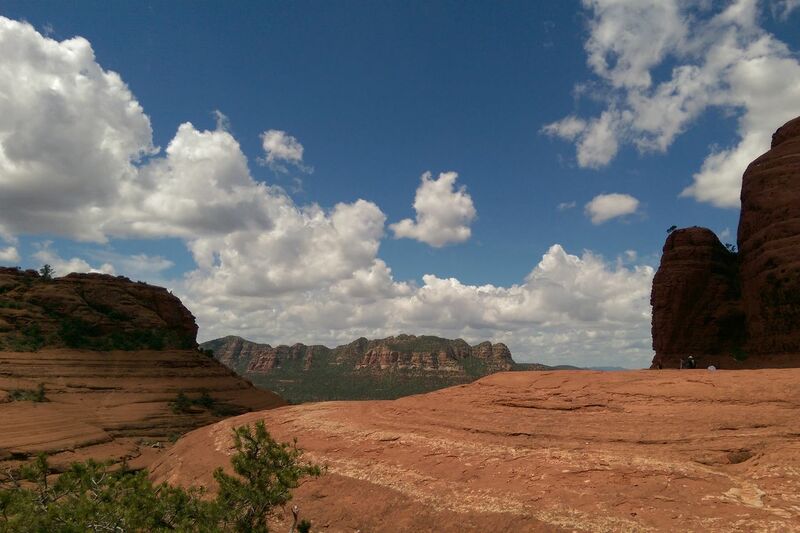 The beautiful views of Sedona Arizona did not dissapoint. The trail being wet made some of the obstacles tougher than normal making the day a great one as we played around on many of then trying different lines. We hung out on the over look and had some hot chocolate which was perfect. 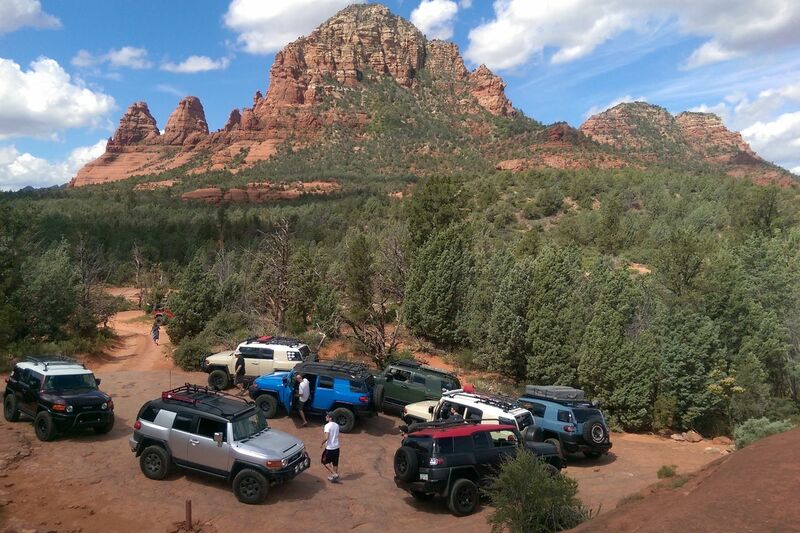 It was not crowded at all and we only ran into 3 other Jeeps. The weather was nice with a light sprinkle of rain. We stopped in Sedona and had some terrific Mexican food at one of the many places to eat. Go out and see the awesome colors!! I forgot to add the pics!! 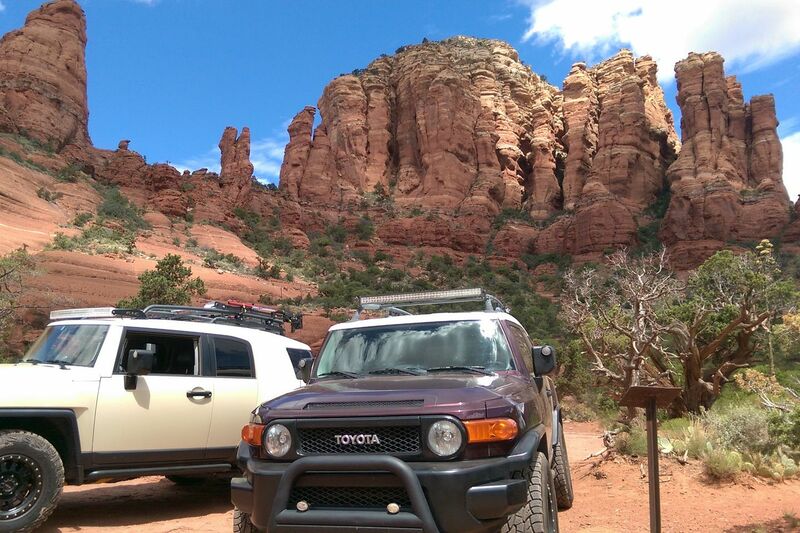 It was a perfect day out on the Broken Arrow trail. 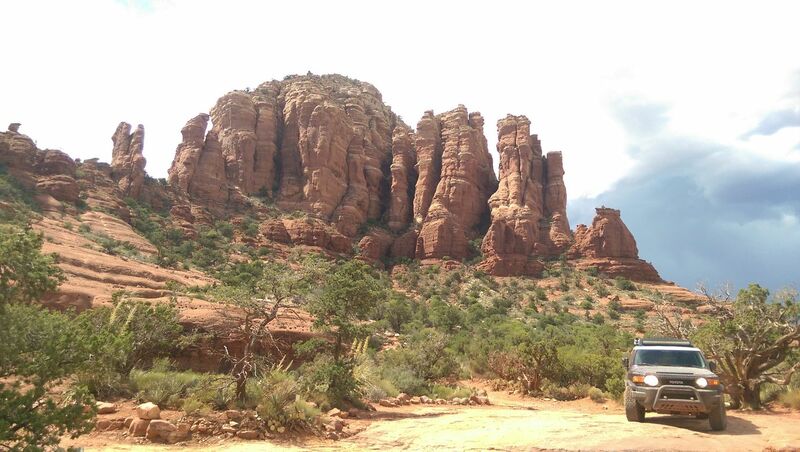 The beautiful views of Sedona Arizona did not dissapoint. The trail being wet made some of the obstacles tougher than normal making the day a great one as we played around on many of then trying different lines. We hung out on the over look and had some hot chocolate which was perfect. 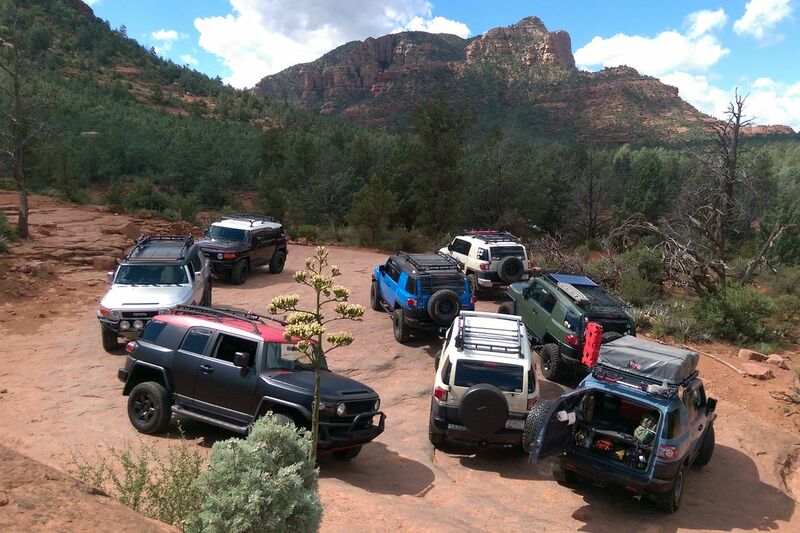 It was not crowded at all and we only ran into 3 other Jeeps. The weather was nice with a light sprinkle of rain. 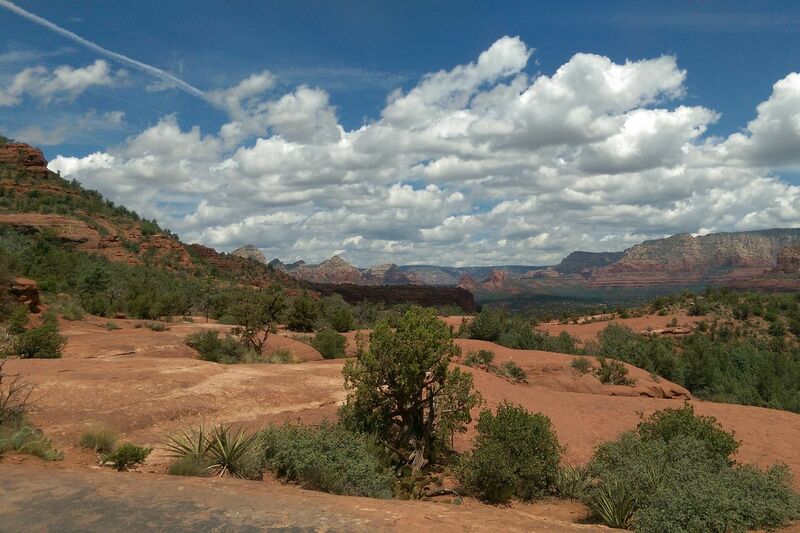 We stopped in Sedona and had some terrific Mexican food at one of the many places to eat. Go out and see the awesome colors!! I ran this trail in the late afternoon, which was nice with the sun being low in the sky allowed the towering rock formations to kept the sun off me and provided a different kind of scenery as the rock formations were more dramatically highlighted. The traffic was mostly Pink Jeeps driving tourists around, and I let them pass as I was stopping often to take lots of pictures of the beautiful scenery. 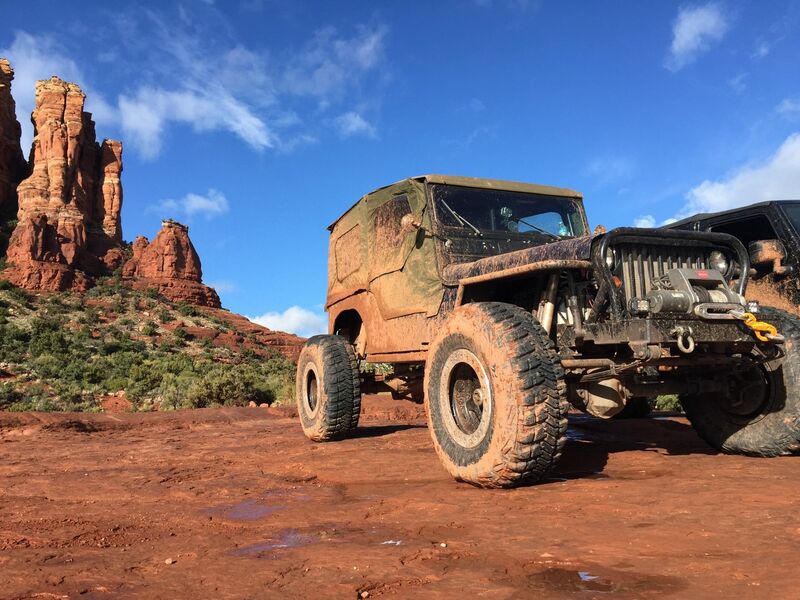 with four of them in front of me on the trail, once of them decided to break a sway bar link caused the axle to move instead of the wheels when steering. I had to wait for them to transfer tourests, and spend the time talking to them and taking pictures for them. Otherwise it was an uneventful, but fun trip full of awsome scenary. Easy trail but worth the time. Trail is close to town and is very scenic. 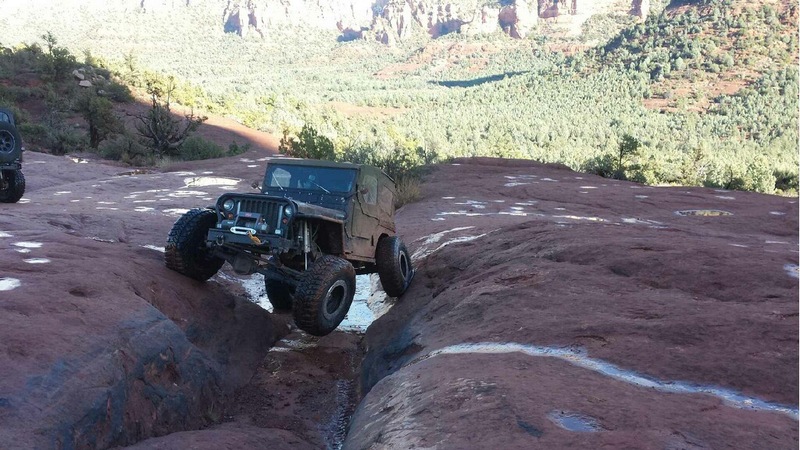 The main obstacle is "Devils Staircase" but don't let the name scare you. 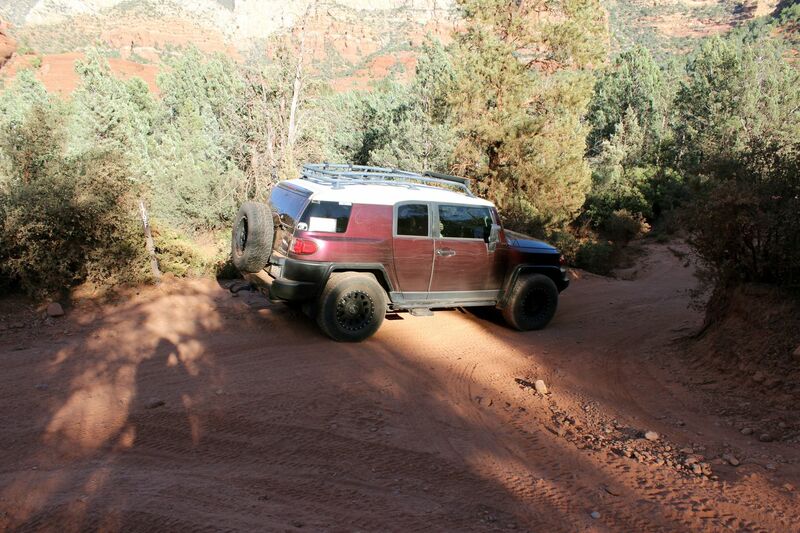 It's a fun trail and stock 4wd high clearance vehicles will have no problem.